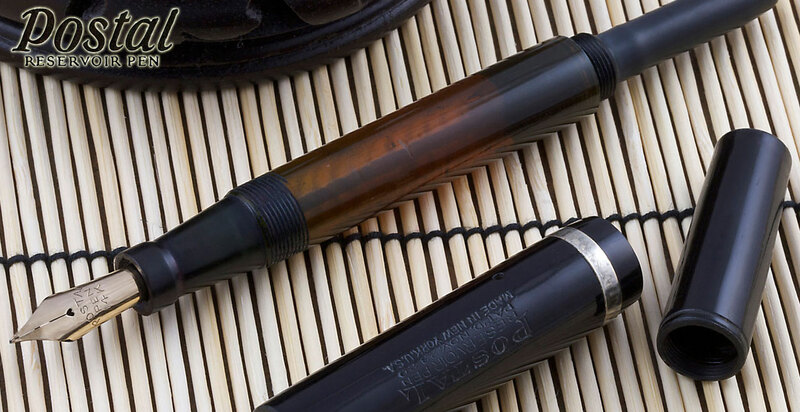 The Aqua Pen was the 1959 patented brainchild of Max Goldman and Alex Goldman of the Universal Fountain Pen & Pencil Company, Inc., and is actually an idea that goes back to the Trench Pens of World War I. It uses a replaceable "Ink Activator Cartridge" that contains a dry ink impregnated sponge that is activated by dipping the nib in plain water, squeezing it to draw in the water and making ink! Read our updated article! We've added several new user guides to the Library Of Vintage Pen And Pencil User Guides, now 100 total! Thanks to Oleg Sultanov, Mark Woodhouse, and Liz Butcher for providing the most recent scans! There are 100 vintage user guides and instruction sheets in the library. We welcome any more that our readers can add! We've updated the article with this Inlaid Pearl and Black Stripe ringtop fountain pen. The pen barrel and cap appear to each be made from three separate pieces that are probably glued together. The two end sections of the cap and barrel are a rounded solid black plastic. The center is a tube of alternating wide black and narrow faux mother of pearl strips and given the name, the pearl elements may be inlaid. See the update and new photos! 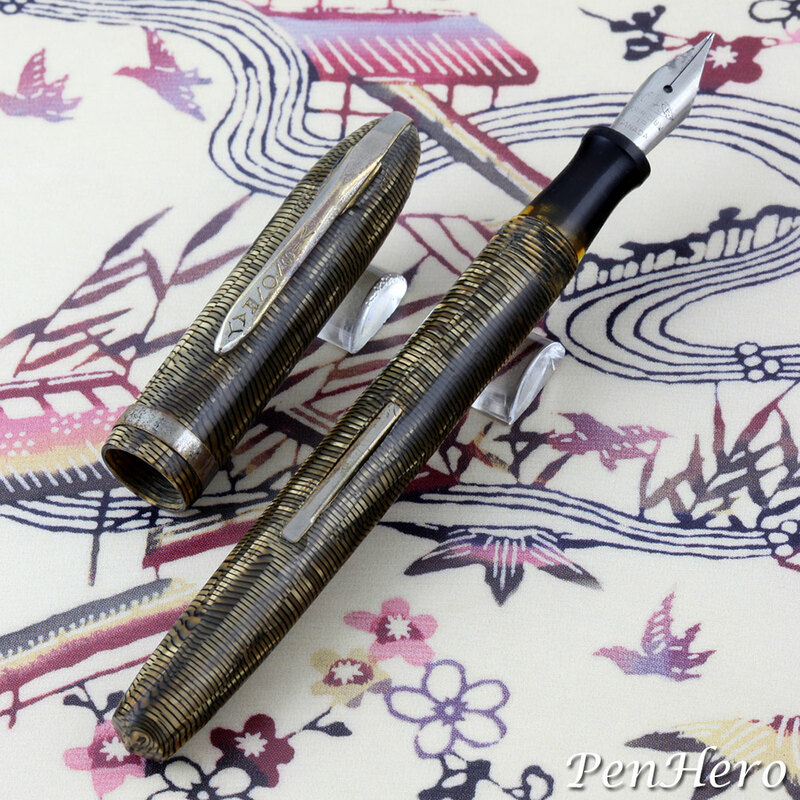 This is an unusual cartridge fountain pen made by the Golden Star Pen Company that features rows of non-repeating Chinese characters that the owner identified as representing teeth. Perhaps the design was to appeal to dentists in a way similar to doctor’s pens. 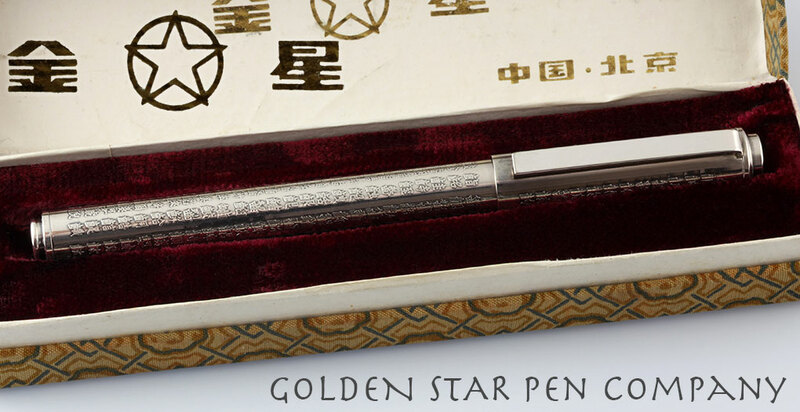 This Golden Star Pen Company fountain pen is very eye catching with its eight rows of Chinese characters running down the cap and barrel. The characters create a pebbly texture in the hand. Read more about it in our new article! Wahl machine turned pens have become a focus niche, with some collectors seeking complete sets of the patterns across all the pen lines, including hard rubber pens, which also carried some of the same patterns as the metal pens. Other collectors focus on just the pencils, in their various sizes and designs, or the ringtop pens, tiny jewels, which also came in several styles. Wahl pens and Eversharp pencils were very popular and durable so many good examples exist today, allowing for the possibility of a large and varied collection of quality writing instruments. Explore the many cataloged designs from 1921 to 1929! 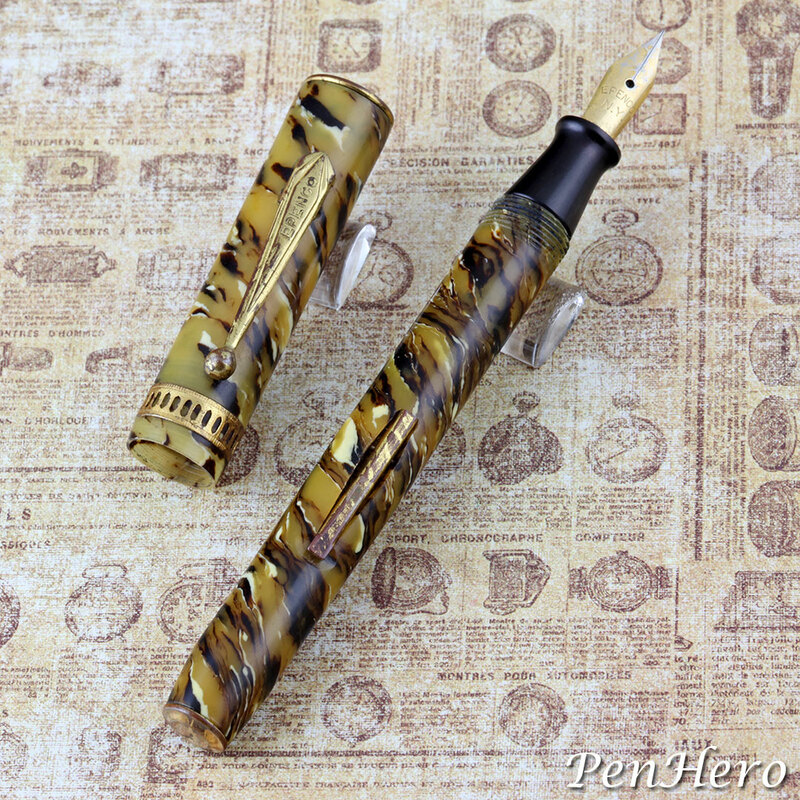 The Parker Trench Pen was designed to meet the writing needs of World War I American soldiers in the field who could not bring bottled ink with them. 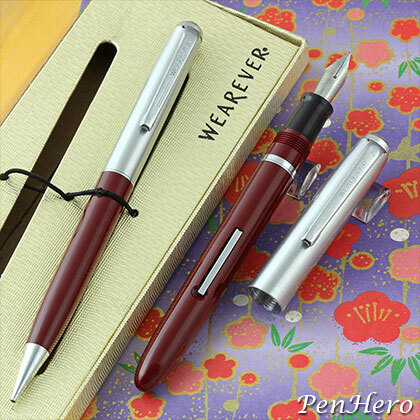 The pen is a standard Parker Jack Knife Safety eyedropper pen with an extra-long end cap intended for storage of ink pellets. 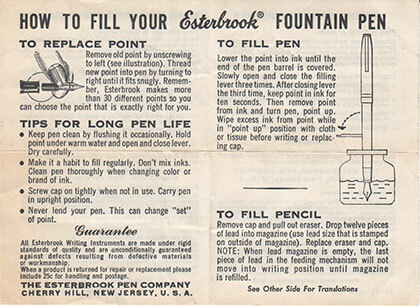 To refill, the user would take one or two tablets out of the end cap, unscrew the nib section, drop them in the barrel, add water, and the tablets would dissolve, making ink. This eliminated soldiers having to carry ink bottles. 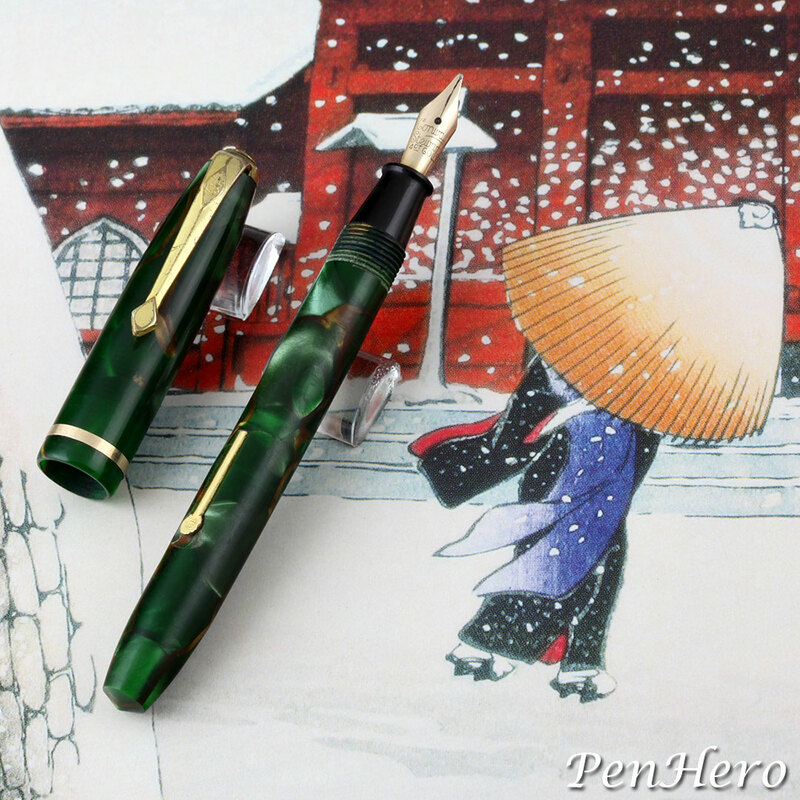 Take a look at a true rare and historical pen! Pen hunting often turns up the unexpected. In this case it was a Plato pen, a previously unknown to me brand from India, made by Mhatre Pen Plastic Industries. Mhatre was a pioneer in the pen industry in Mumbai, incorporated on August 18, 1951. Formerly called Bombay, Mumbai is a major financial and manufacturing center on India’s west coast and India's largest city. It is the heart of the Bollywood film industry. 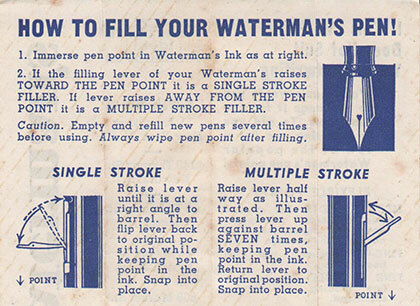 Postal Reservoir Pens were offered by mail order at least from 1925 to 1928. The company's direct to consumer strategy made them able to price the pen much cheaper than top brand pens at $2.50 when the Parker Duofold sold for $7.00. 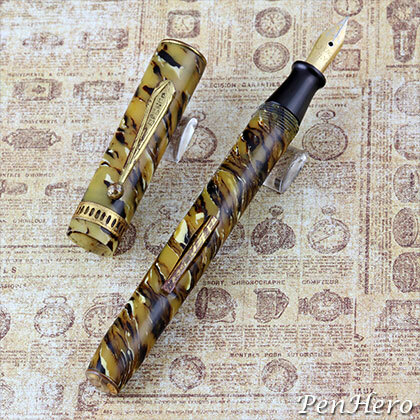 The Postal Reservoir Pen is very large even by today's standards, being 5 11/16 inches long with the cap on and 6 15/16 inches long with the cap posted on the end of the barrel. 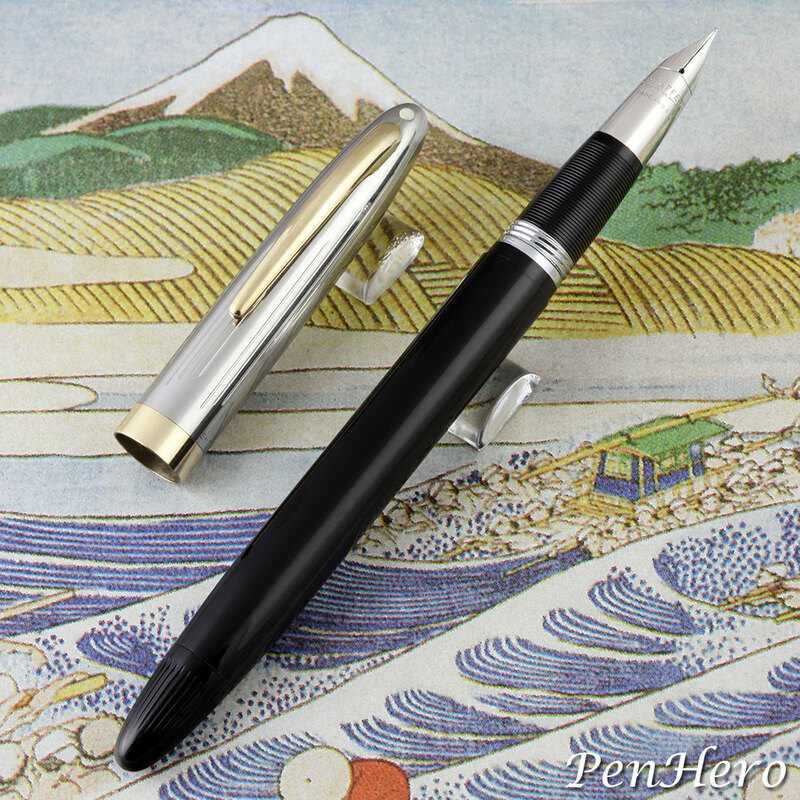 Popura Shugyo K.K., was a small pen company in Tokyo, Japan that operated probably from the 1930s to the 1950s. 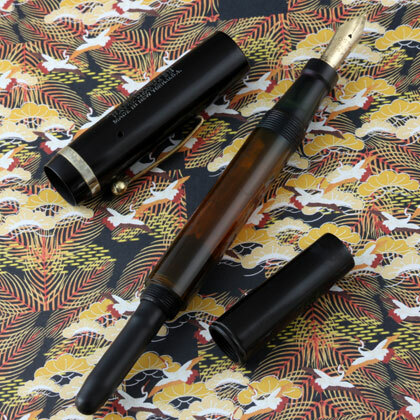 This Popura eyedropper fountain pen dates from the early to mid c. 1930s and the cap and barrel carving represents Heian era coins. 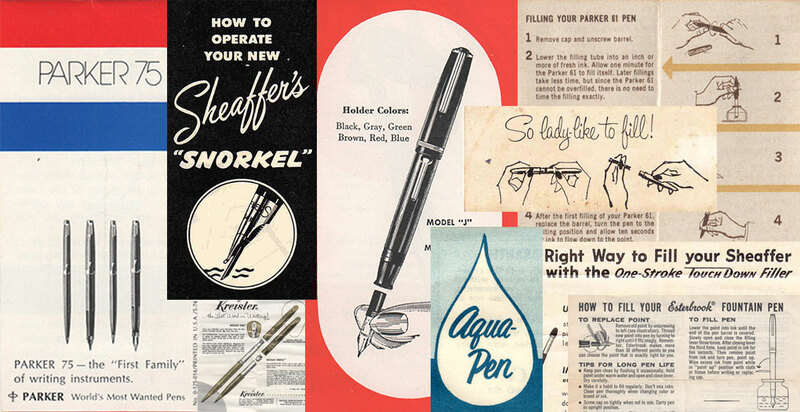 We updated the Sheaffer Advertisement Gallery with more than 200 ads from 1924 to 1967. There is a slideshow of original scans with a maximum height of 1280 pixels. Below the slideshow are small thumbnails of all of the slides in date order with click to enlarge to full size. Updated as of August 28, 2018! Click here for links to all 2018 shows! PenHero 2018 Calendars Still Available! Now available for purchase on Lulu.com - click this link! The Wahl Pen Company was the leader in machine engraved metal fountain pens and pencils in the 1920s, making numerous unique designs in solid gold, gold filled, sterling silver and enameled metal pens. Twelve memorable designs are captured here: Check, Colonial, Colonnade, Console, Dart, Grecian Border, Lakeside, Niagara, Ring Colonial, Ripple, Wedgewood, and an uncatalogued enameled design. 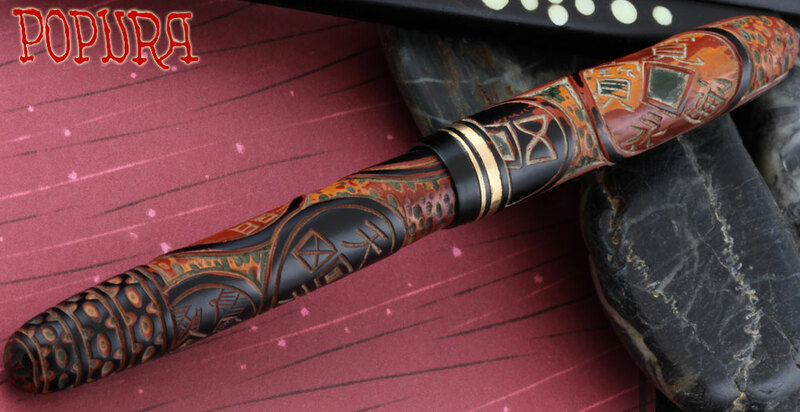 The designs are shown on medium, slender medium, short medium and ringtop pens and dated according to when that design appeared on the particular model pen presented. With this calendar, you can take home twelve collectible Wahl pens from the 1920s and enjoy a new one each month! 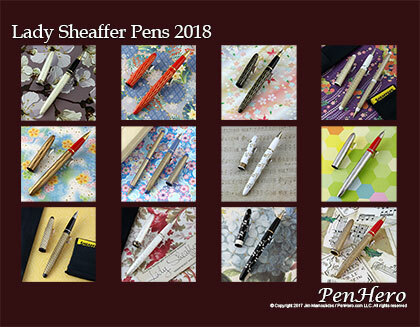 Sheaffer launched the new Lady Sheaffer pen line in 1958, looking to capitalize on trends in ladies fashion. These were cartridge only Skripsert pens that ranged in price from $10 to $35 across 18 different models and were packaged similar to beauty and fragrance products. 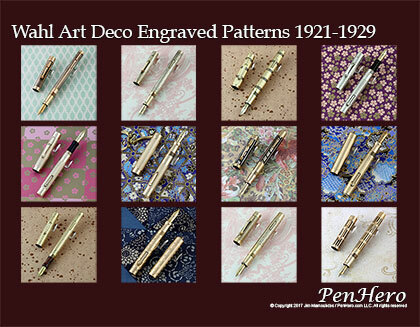 The pens featured a metal cap and barrel with special machine engraving work, including Tweed, Corduroy, Paisley, Tulle, Moire, Brocade, Satin, Petit Point, and Damask in a variety of colors. 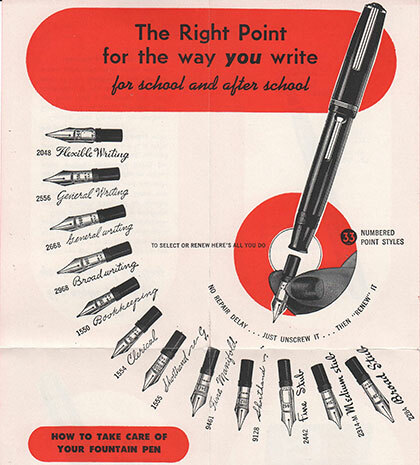 The pens used the Sheaffer conical nib from 1958 to 1961, and then were switched to the new inset Stylpoint nib from 1962 to 1964. Each pen has a color section to match or compliment the cap and barrel finish. Some models are difficult to find and highly collectible. Enjoy twelve of these pens in 2018! PenHero Quarterly Q2 2017 Now Available! Now available for purchase on Amazon.com - click this link! 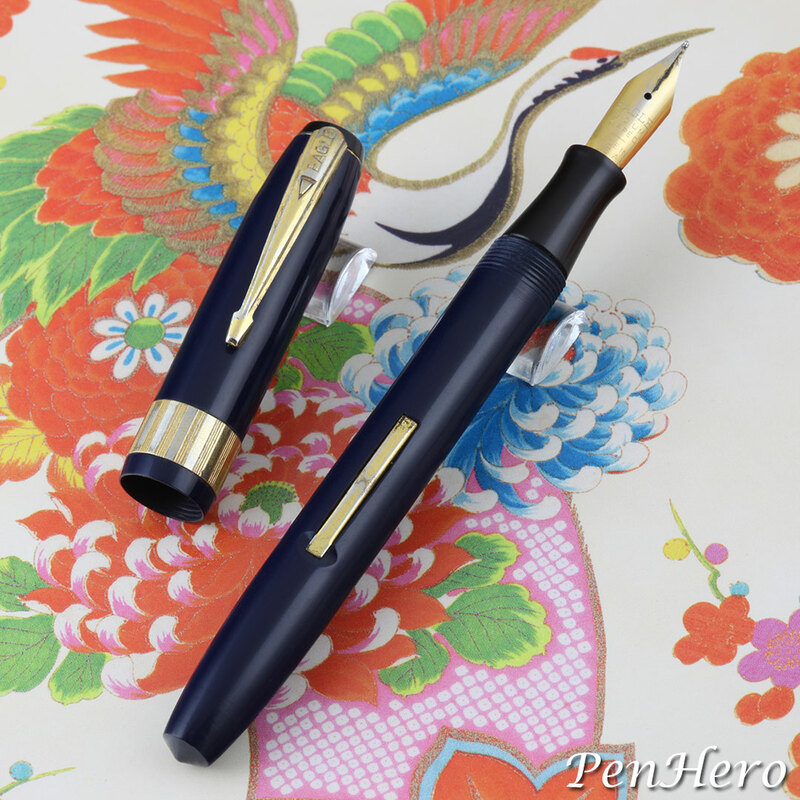 PenHero Quarterly features a new pen every day! Written and photographed by Jim Mamoulides of PenHero.com, the 100 page 8.5x11 inch perfect bound paperback book features 91 full color pages, each with large photos, including a history and description of some of the most unusual and valuable pens in the world. Your on-line writing instrument magazine, featuring detailed reviews, history, news, shows, and product announcements, and more links to writing instrument focused sites than any other source. This is a Wearever Pacemaker lever fill fountain pen and pencil set in red c. 1954-1960. This 5 5/16 inch long example has no barrel stamping, though many do, and features a flexible fine "Replace-A-Point" stainless steel nib stamped FLEXFINE and WEAREVER and 8362 USA and the clear C-flow feed. The nib unit name was trademarked January 31, 1954, and they unscrew, similar to an Esterbrook nib unit, and were offered in extra fine, flexible fine, medium flexible, medium firm, broad and steno. The all metal cap appears to be brushed steel topped with a metal cap top and WEAREVER stamped clip. The section has a metal trim ring that closes flush when the cap is screwed on, a quality feature unusual for this brand. They were offered in red, blue, gray and green, based on known examples, and sold for $1.95. Sets with matching twist action pencils were also offered. Note the pencil has the Pacemaker stamping on the barrel. This is a Bayard accordion filler fountain pen c. 1950s. According to fountainpen.it, the name Stylo Bayard was given to the Panici Frères & Co in 1934, a company that had a history back into the 1800s. Bayard continued in the pen business until the 1970s. This 5 3/8 inch long pen is an accordion filler, which uses a special rubber ink sac that is ribbed like an accordion with one end attached to the nib section and the other to a clear plastic push button, as shown in the photo. 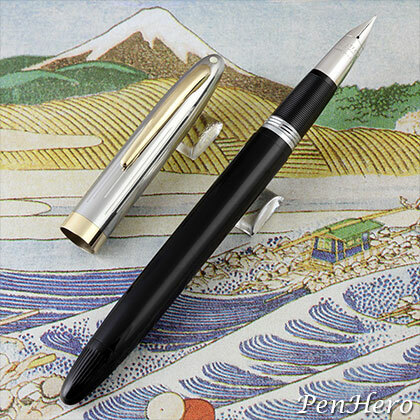 The pen is operated by dipping the nib in ink and pressing the button until ink can be seen in it. The feed has a long breather tube to help with this operation. Accordion fillers were popularized in France after the expiration of the 1938 patent by the Stylomine company, with many companies adopting it. The clip has an inner spring, to make it easier to pocket. All trim is gold plated. The barrel is stamped "Fit de Bayard." The 18 karat gold nib is stamped BAYARD over 18ct over 40. 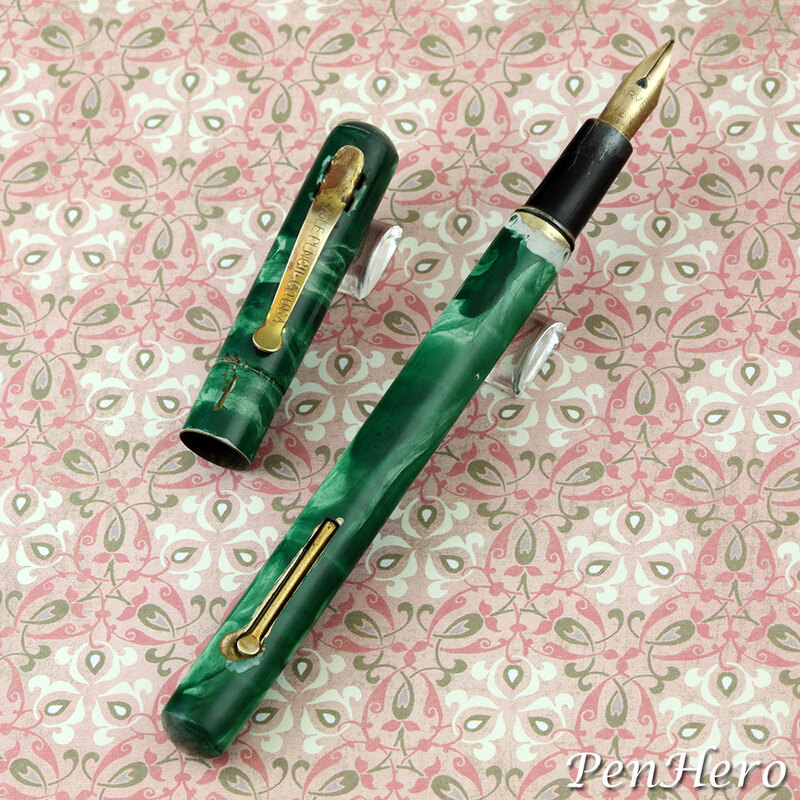 This is a Wearever Pacemaker lever fill fountain pen in green c. 1954-1960. This 5 5/16 inch long example has WEAREVER "Pacemaker" over NORTH BERGEN N.J. over U.S.A. stamped on the barrel. It features a flexible medium "Replace-A-Point" stainless steel nib stamped MED-FLX and WEAREVER and R43 USA and the clear C-flow feed. The nib unit name was trademarked January 31, 1954, and they unscrew, similar to an Esterbrook nib unit, and were offered in extra fine, flexible fine, medium flexible, medium firm, broad and steno. The all metal cap appears to be brushed steel topped with a metal cap top and WEAREVER stamped clip. The section has a metal trim ring that closes flush when the cap is screwed on, a quality feature unusual for this brand. They were offered in red, blue, gray and green, based on known examples, and sold for $1.95. Sets with matching twist action pencils were also offered. Note this example still has the price sticker on the cap. This is a Wearever Pacemaker lever fill fountain pen in black c. 1954-1960. This 5 5/16 inch long example has WEAREVER "Pacemaker" over NORTH BERGEN N.J. over U.S.A. stamped on the barrel. It features a flexible medium "Replace-A-Point" stainless steel nib stamped BROAD and WEAREVER and R44 USA and the clear C-flow feed. The nib unit name was trademarked January 31, 1954, and they unscrew, similar to an Esterbrook nib unit, and were offered in extra fine, flexible fine, medium flexible, medium firm, broad and steno. The all metal cap appears to be brushed steel topped with a metal cap top and WEAREVER stamped clip. The section has a metal trim ring that closes flush when the cap is screwed on, a quality feature unusual for this brand. They were offered in red, blue, gray and green, based on known examples, and sold for $1.95. Sets with matching twist action pencils were also offered. 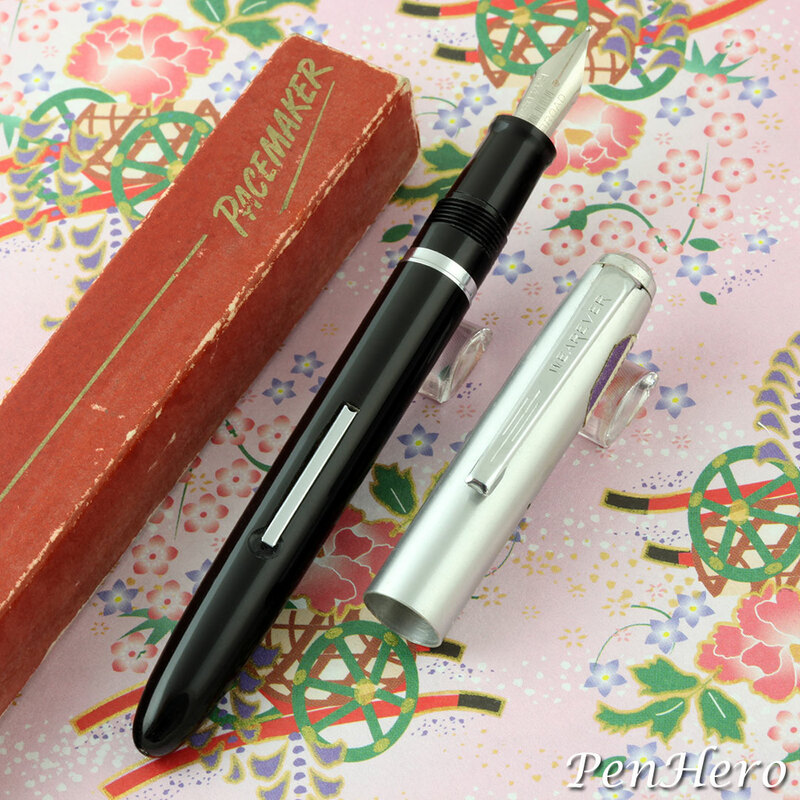 Note this example still has the price sticker on the cap and includes the original single pen box. 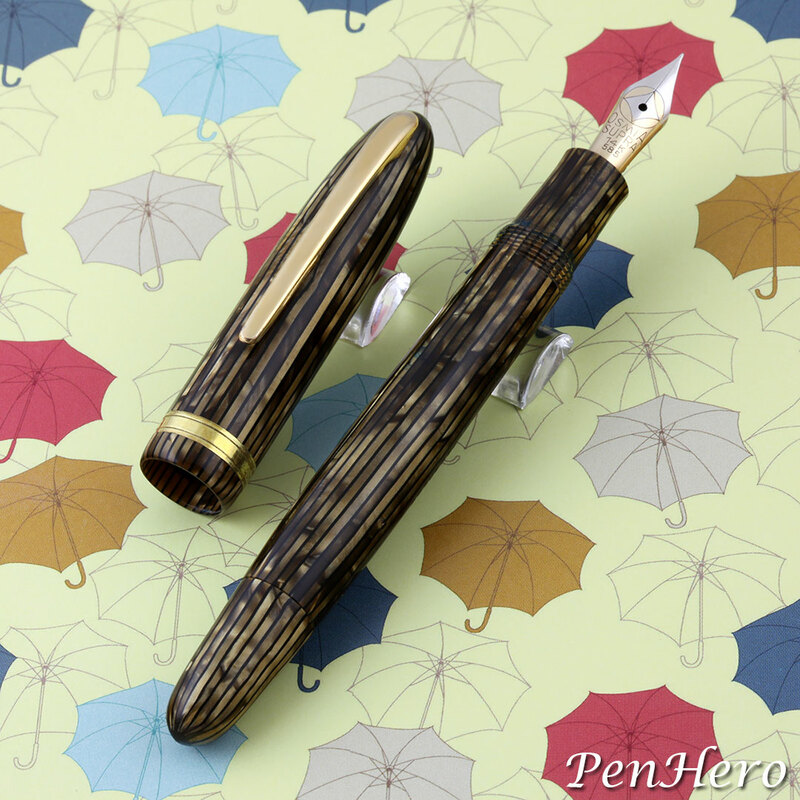 This is an Osmia Progress 294 brown stripe vacumatic type filler fountain pen c. 1950. This just under 5 ¼ inch long pen operates by unscrewing the blind cap, which extends the plunger. Dipping the nib in ink and cycling the plunger fills the ink chamber in the barrel. The striped celluloid barrel is opaque. The cap top has the Osmia white four point diamond inside a circle logo. All trim is gold plated. The barrel is stamped with the scales logo then A. W. FABER CASTELL over PROGRESS and 294 is stamped near the blind cap above an M. The firm two-tone 14 karat gold nib is stamped OSMIA over SUPRA over 14K over 585 all under the Osmia logo. This is an undocumented and uncatalogued Lady Sheaffer pen c. 1959. This clipless model features a black enameled metal cap and barrel with an engraved gold filled long double wave pattern similar to the Lady Sheaffer I Tweed single wave pattern. Unfortunately a good bit of the fill is worn off. The section is Jet black color to match the cap and barrel. The palladium silver nib is not hallmarked. The nib section is silk screened MED over $10.00, possibly indicating a test of a $10.00 price point pen. It's about 5 3/8 inches long capped. It's possible this is a prototype or a short run model. 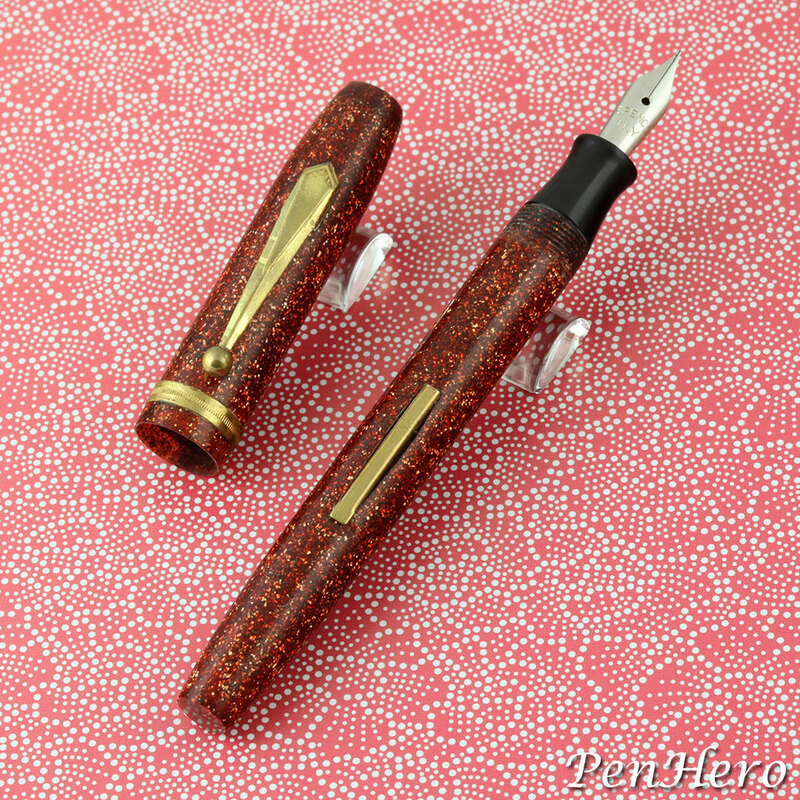 This is a Lady Sheaffer XXI Satin Mandarin Red c. 1958-1962. Satin is a fabric woven in which the filling threads are interlaced with the warp at widely separated intervals, producing the effect of an unbroken surface, typically glossy with a dull back. The Lady Sheaffer XXI Satin has an etched satin pattern on a silver color finish. The pen has gold-plated inlay center bands. The nib section is Mandarin Red, Sheaffer’s number 19 Vermilion color. The nib is unhallmarked gold. 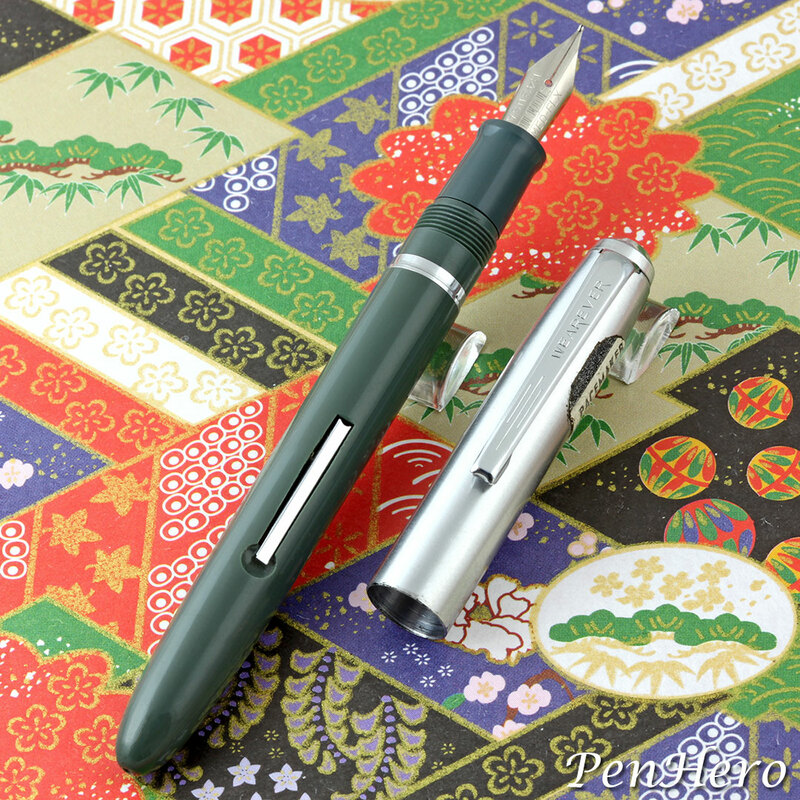 The fountain pen sold for $20.00 and the matching pencil sold for $7.50. This is an Eclipse Streamline fountain pen and pencil set in maroon striped celluloid c. early 1940s. 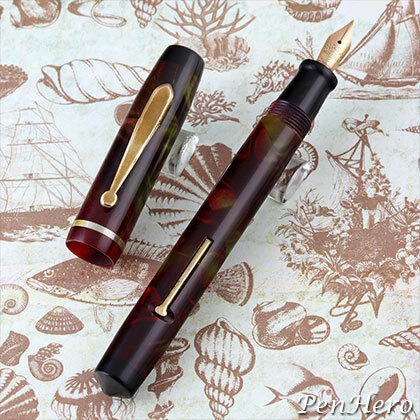 The celluloid is very similar to the Maroon "iridescent Laidtone Permanite" used on the 1940s Parker Duofold pens. 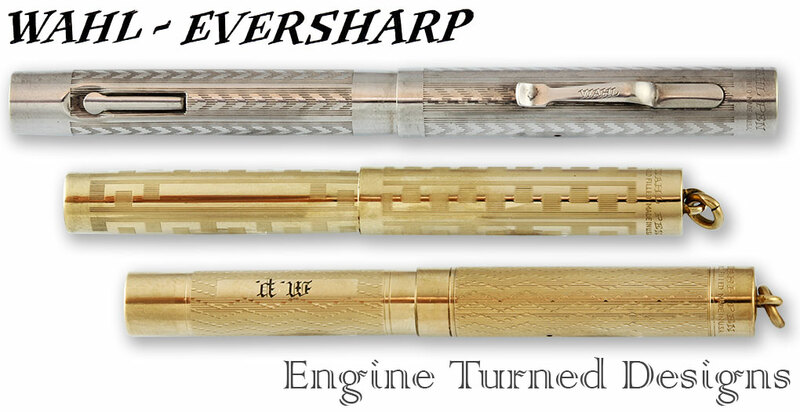 The Eclipse Streamline appears to borrow design elements from the Eversharp Skyline clip. The 5 1/4 inch long pen is a lever filler and has no barrel imprint. 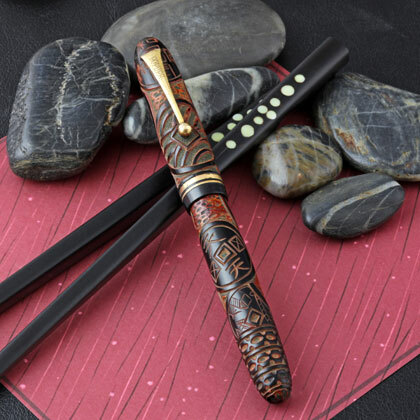 Many different celluloids were used on the Streamline pen, including black, marbled colors and snakeskin colors. At least two barrel shapes are used, including this flat end with a pointed end cap and a more tapered end. The clip and trim are gold plated, though it shows wear. The very firm stainless steel nib reads ECLIPSE over OSMIRIDIUM over POINTED over CANADA. 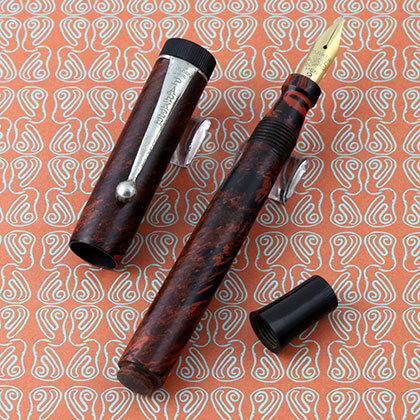 This is an Eclipse Vis-O-Ray fountain pen in brown snakeskin celluloid c. 1940s. This 5 3/16 inch long Vis-O-Ray follows the Streamline design with a bullet shaped cap and a similar over the top clip stamped VIS-O-RAY. The name may derive from the visulated section. It's a lever filler and has VIS-O-RAY over ECLIPSE FOUNTAIN PEN AND PENCIL CO. LTD. over TORONTO - CANADA over DESIGN REG. stamped on the barrel. Many different celluloids were used on Streamline pens, including this example. The clip and trim were gold plated, though most has worn off. The very firm stainless steel nib reads ECLIPSE over OSMIRIDIUM over POINTED over CANADA. 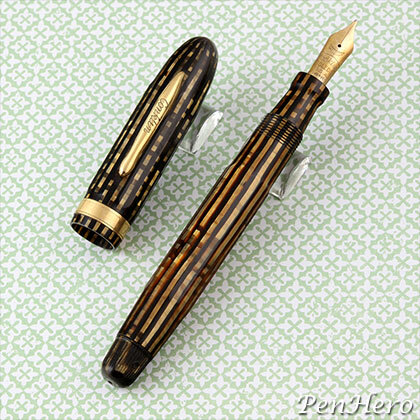 This is a short size Conklin Nozac Penline Golden faceted piston fill fountain pen c. 1937. 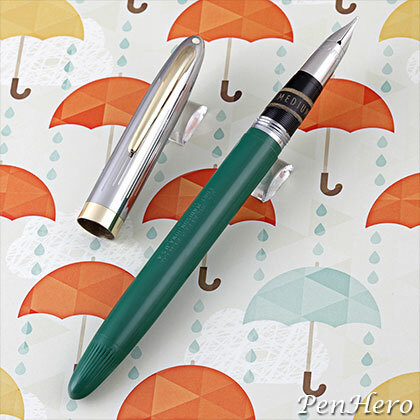 Conklin announced four new Penline colors in 1937, including Grey, Red, Green and Golden based on a 1935 patented brickwork and stripes design celluloid. The brickwork Penline pens were introduced in 1937. Nozac pens use a piston filling system Conklin introduced in 1931. The pen fills by twisting the end cap while the nib is in ink. The ink level could be seen in the translucent front end of the barrel. These 4 7/16 inch long pens used the 1936 patented clip and this one has a 14 karat gold nib stamped CONKLIN over TOLEDO over POINT over 14KT over U.S.A. At the top of the nib is the Conklin Crescent logo. Small size Nozac Penline pens like this one sold for $7.50 and the matching pencil was $3.50. The small size Nozac was also cataloged in black. Note the section is also made from the cap and barrel celluloid. 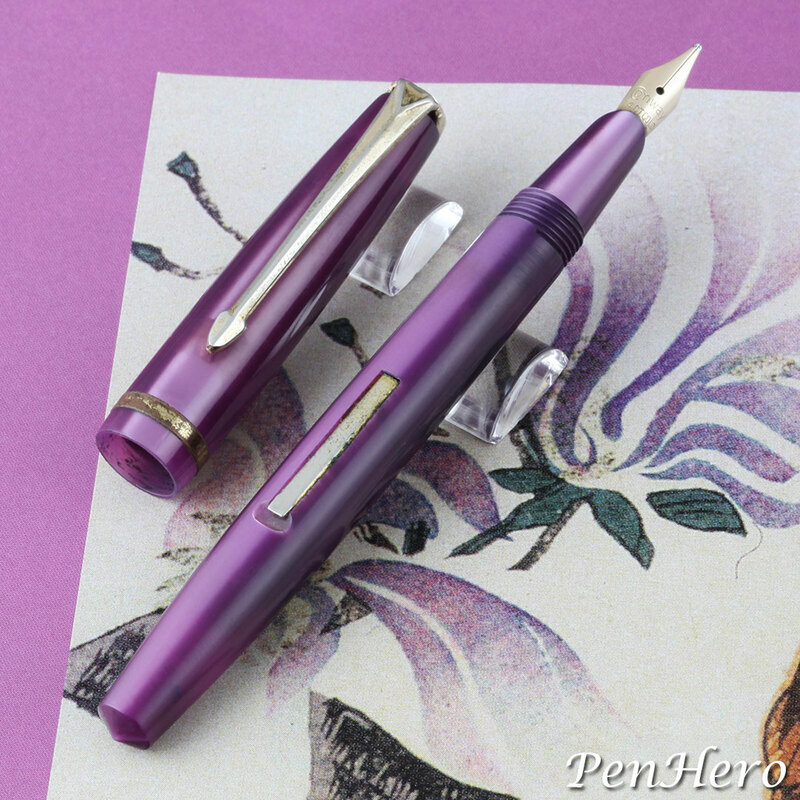 This is a Conway Stewart 570 fountain pen in an iridescent lilac acrylic c. 1960s. It's a 4 1/2 inch long lever filler with all gold plate trim, though the trim shows heavy plating loss. Some sources date this model from 1964 to 1972. It came in several iridescent colors including blue, red and green, called "Lumina" by some collectors. The acrylic has a strong luminosity from dark to light that changes when seen from different angles. The barrel is stamped Conway Stewart 570 over HOLDER FOREIGN, indicating the cap and barrel were sourced outside the UK, some collectors believe West Germany. 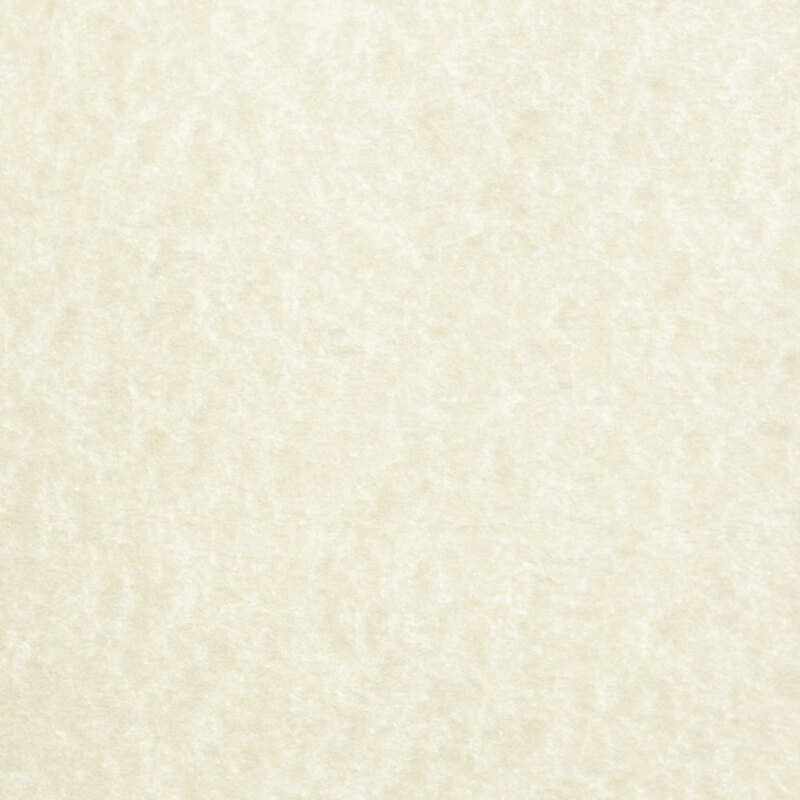 The 14 karat gold nib is stamped Conway over 14CT GOLD. 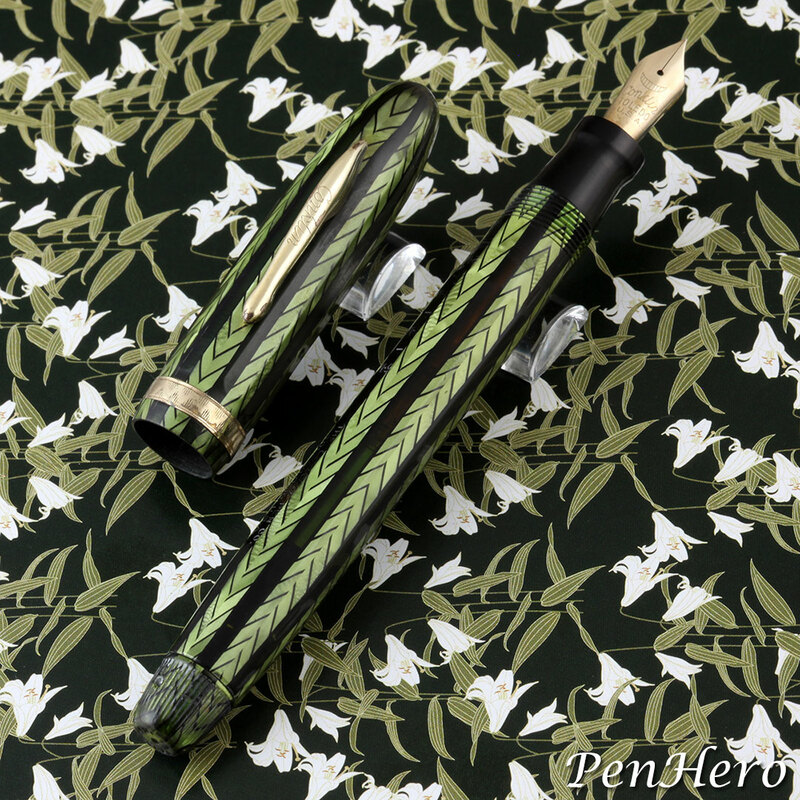 This is a Conklin Nozac 5000 word Chevron design in green celluloid c. 1936. 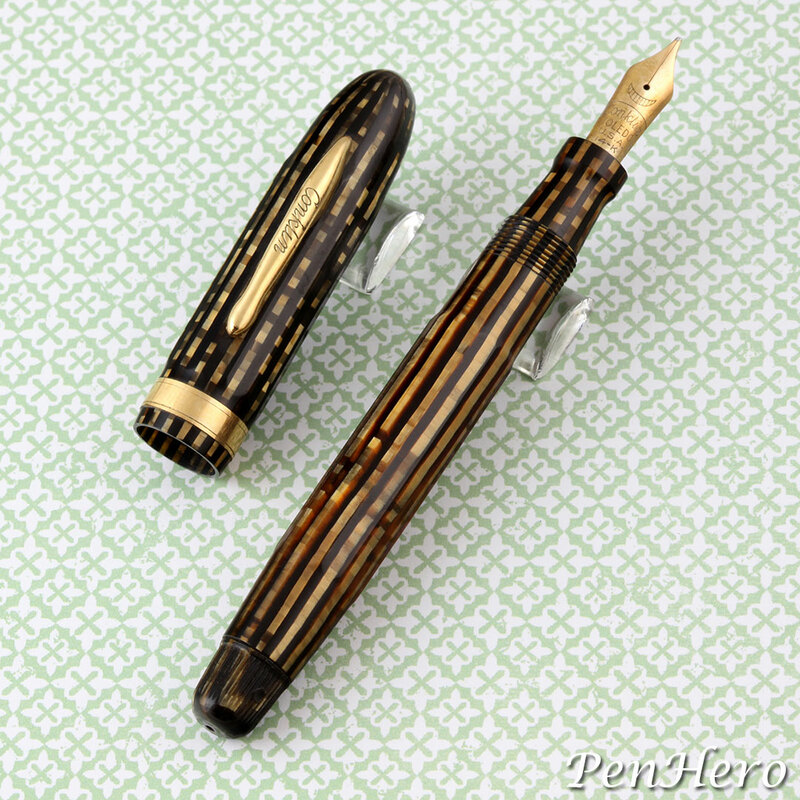 Conklin introduced two new lines, Chevron and Penline in September 1936. Each is constructed of tubes made from sheet celluloid with repeating striped patterns. Chevron pens have translucent strips separated with strips of alternating direction rows of colored celluloid arrows. The sheets were wrapped into cap and barrel tubes that were then worked into finished caps and barrels. The seam can be found with careful examination. Look for the white line near the base of the cap. This tube construction method allowed the barrel to be a single piece with the translucent strips in the top half for viewing the ink level. You can see the Word Gauge on the top left of the barrel and the imprint further down. The bottom half hides the piston mechanism. The Chevron came in three colors: red and silver, silver and green, and two sizes, 7000 word and the slimmer 5000 word shown here. Both pens are the same length, about 5 1/4 inches long. This example has the 14 karat gold Conklin Toledo nib instead of the Cushon Point nib that was introduced in 1936. The model also features the new 1936 patent clip. The 7000 Word Gauge Chevron sold for $7.50 and the 5000 sold for $5.00. Matching pencils were $3.75. 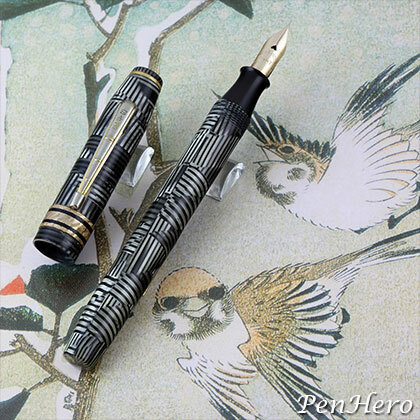 This is a Salz fountain pen in a gray and black crosshatch celluloid c. 1930s. It's a 5 3/16 inch long lever filler with all gold plate trim, though the trim shows heavy plating loss. Salz Brothers was located in New York City and may be best known for making the tiny Peter Pan pens. By the late 1930s the company sold pens under the Stratford name and later Stratford pens bear such a strong resemblance to Wearever models that they may be made by Wearever. The clip has the Salz name, though no other markings appear on the pen. This example came with a quality 14 karat gold Warranted nib. 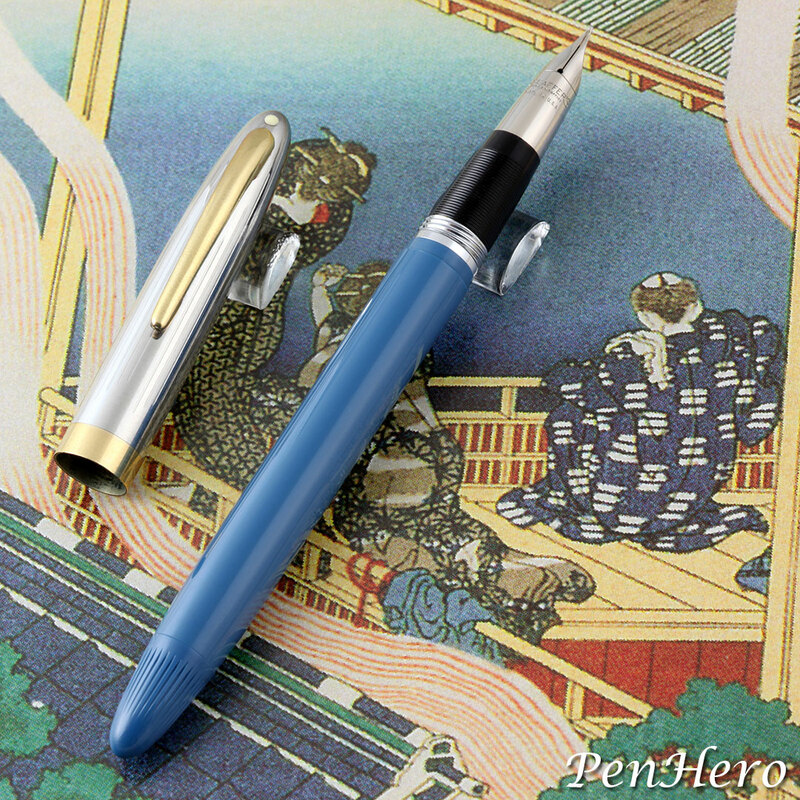 This is a Sheaffer Balance Blue Short fountain pen c. 1931-1932. It's a 4 1/8 inch long lever filler with all gold plate trim. 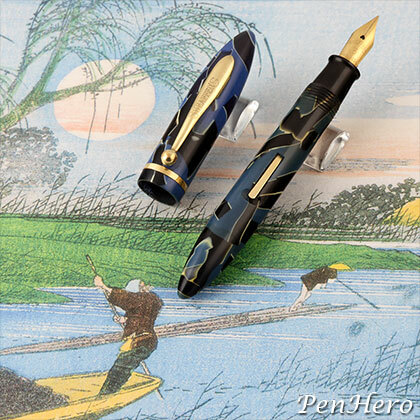 The color name is simply Blue in the Sheaffer price list, though many collectors call this celluloid “blue and black.” Examined in bright light the colors are actually a marble of different shades of blue, though on discolored pens the darker blue will appear black. This blue marble was offered on non-White Dot Balance pens, including a longer clip model and a same size ringtop model. The 14 karat gold nib is stamped SHEAFFER’S over 3 over MADE IN U.S.A. It sold for $3.25 and the matching pencil sold for $2.50. This is a Lambrou Pens ZJ2 Prototype fountain pen with CP3 Iliad Diamond Spirale Guilloche engraving from 2009. This 5.8 inch long unique prototype is a cartridge/converter fountain pen based on the large size Lambrou Pens model MythosR 878. The Diamond Spirale design evokes strength, assertiveness and purity, the virtues of Achilles, the supreme Greek hero. It is engraved by the Murelli Company, on brass, using a special engraving machine. First, the engraver cuts the pen body at 45 degrees to the right, then to the left. Where the cuts meet, they form perfect diamonds. The brass pen was thick silver plated, a minimum of 5 microns. Note that the engraving extends past the clip and also to the straight end of the barrel. The clip is hand crafted in sterling silver by Paul Rossi. 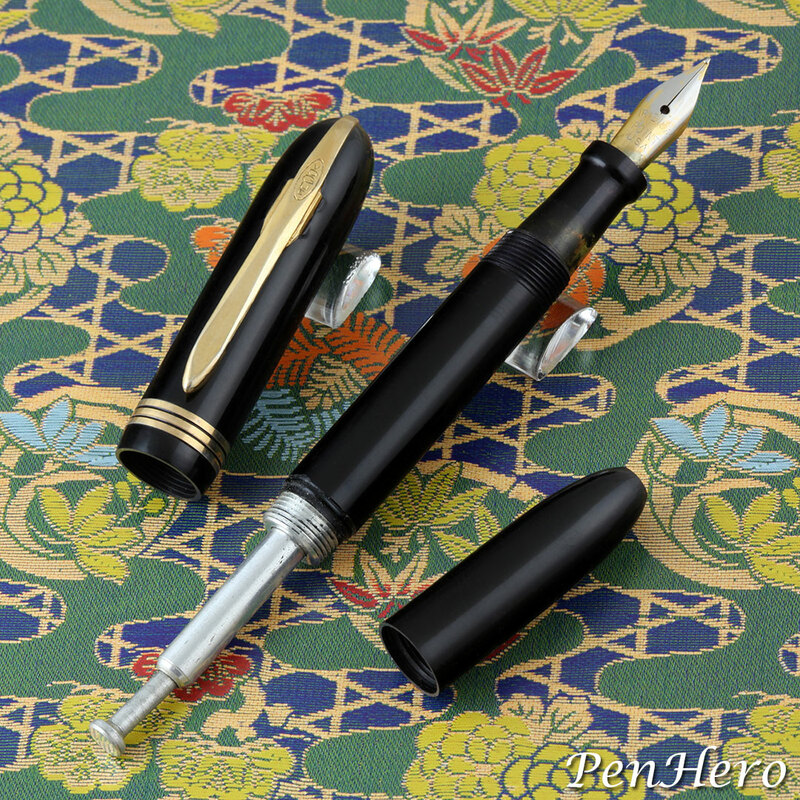 It comes with a G-370 18-karat gold nib unit with ebonite feed by Peter Bock of Germany. The nib is rhodium plated to compliment the sterling clip and trim. This is an Epenco fountain pen in a red glitter celluloid c. late 1930s. Epenco was an Eagle Pencil Company sub-brand. 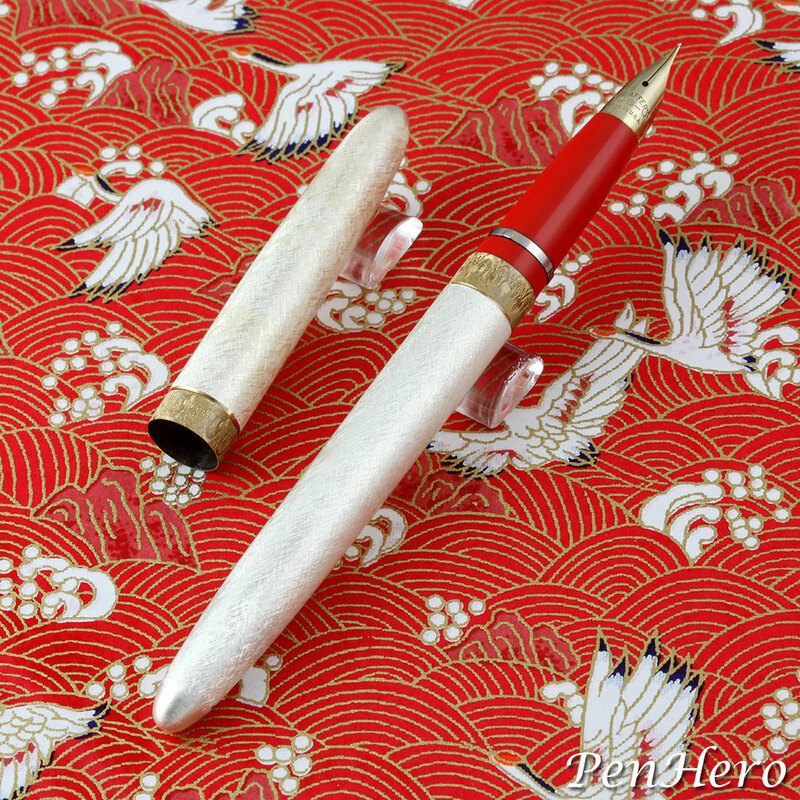 The red celluloid was made infused with gold glitter which shimmers as the pen is turned. 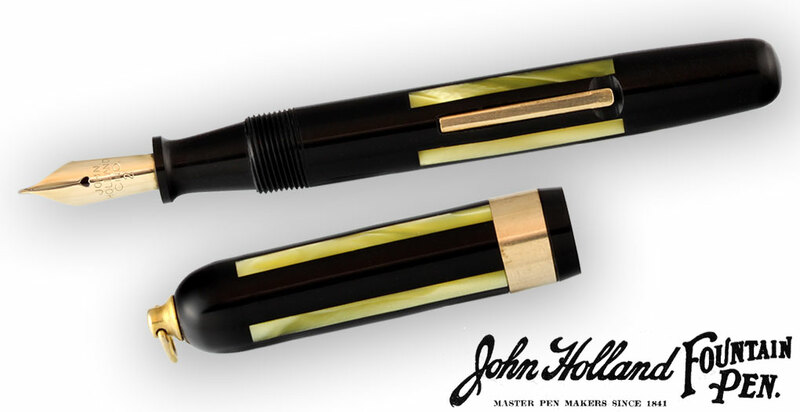 This 4 7/8 inch long pen has a gold plated clip, lever and cap band, and shows some plating wear. The clip is an Eagle patent type and is stamped PATD at the top. The only Epenco markings are stamped on the stainless steel nib, with EPENCO over N.Y. The nib probably was originally gold plated. This is an uncommon UK made Parker Duofold Juniorette made from a rose and black herringbone celluloid probably dating from 1941-1944. It follows the look of the earlier 1930s US streamline Duofolds. It's is 4 1/2 inch long button filler with a Parker Duofold 14 karat gold nib. The imprint is GEO. 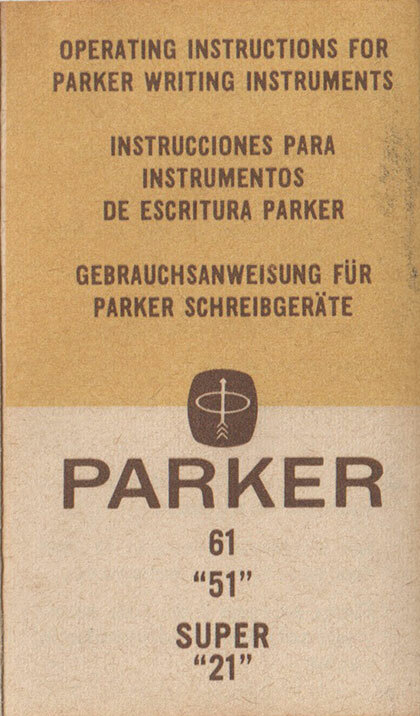 S. PARKER next to PARKER over DUOFOLD next to REG. T.M. There is no date code. These pens are fairly uncommon and were probably made in Senior, Special, Junior, and Juniorette sizes in herringbone patterns of green and black, rose and black, and brown and black. This is a Vogue black fountain pen c. 1940s. It follows the clip and cap design of the Eclipse Streamline and has a full balance shape cap and barrel. This Vogue pen may be made by Eclipse or an Eclipse sub-brand. The clip has VOGUE stamped in an oval at the top, similar to the Eclipse logo on Eclipse Streamline clips. The 5 1/16 inch long pen is a Vacumatic type filler operated by removing the blind cap from the end of the barrel, inserting the nib in ink, and pumping the metal button. There is a spring in the long metal extension from the barrel and the barrel fills with ink. The trim is all gold plated. There are no barrel imprints. The cap band is one piece designed to look like three bands. 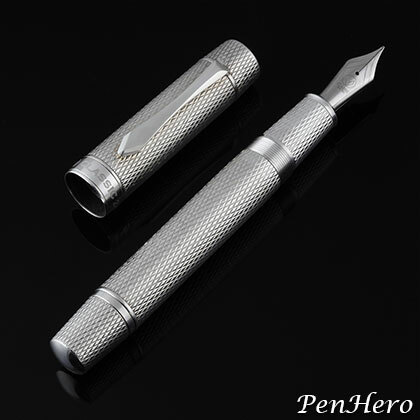 It has a clear ink view section and a firm gold plated stainless steel nib stamped IRIDIUM POINT U.S.A. This is a Vacuum brand fountain pen in black c. 1935-1936. 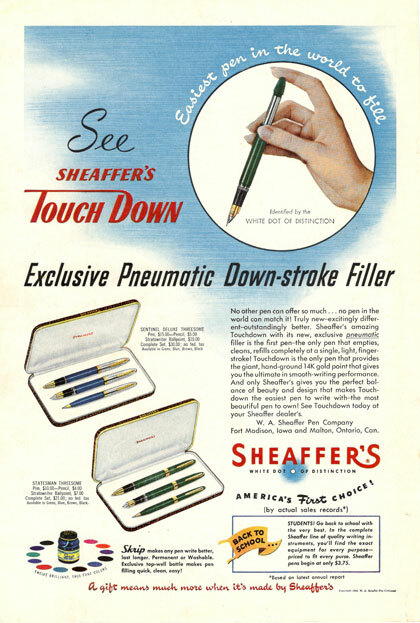 Vacuum-Fil was a Sheaffer sub-brand introduced in 1934 and the pens featured a new single stroke plunger filling system before it was applied to Sheaffer branded pens. This 4 15/16 inch long pen is interesting because of the following: it is a lever fill pen, not a plunger type, the barrel is stamped VACUUM with no other maker markings on the pen, and the nib is an unhallmarked two-tone palladium or platinum plated gold nib stamped VACUUM over MADE IN U.S.A. The nib is the same shape as the Sheaffer Feathertouch nib, but the plating is reversed with the tines staying gold and the bottom plated. Early Vacuum-Fil pens from 1934 have VACUUM-FIL stamped on the ball end clip. 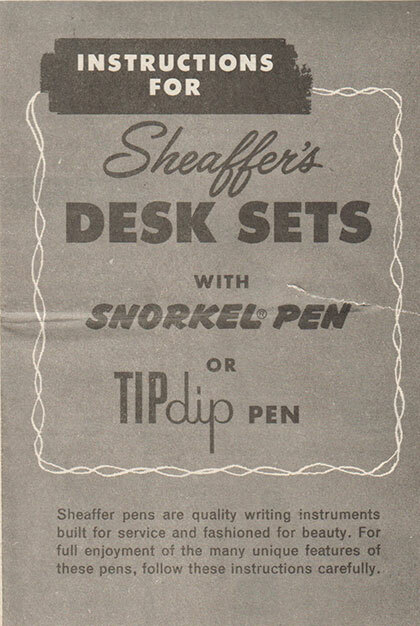 Sheaffer switched to flat ball end decorated and plain clips afterward, possibly 1935-1936. This is a WASP Vacuum-Fil fountain pen in burgundy and olive marble celluloid c. 1936. 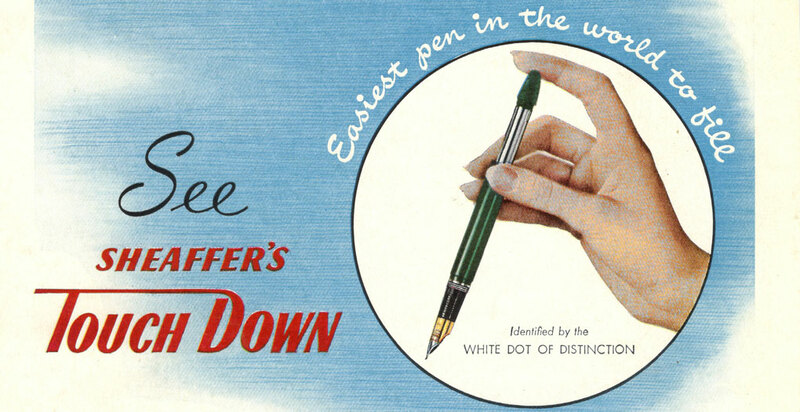 Sheaffer changed the name of the Vacuum-Fil Pen Company to the WASP Pen Company in 1936, WASP being an acronym for W. A. Sheaffer Pen company. This 4 15/16 inch long pen is a lever fill type. All trim is gold plated, though showing a lot of wear. The barrel is stamped WASP over VACUUM-FIL over FT. MADISON, IA, U.S.A. The gold nib is unhallmarked and stamped WASP over MADE IN U.S.A over 2, the nib size. This is an Eagle fountain pen in blue plastic c. 1948-1949. This 5/18 inch long pen features the 1935 patented "Visehold" clip design by Benjamin W. Hanle with EAGLE stamped at the top. 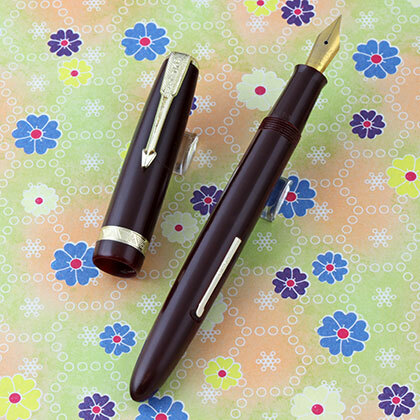 The overall look of the pen is similar to the c. 1939 Prestige model, except this is a lever-fill type. All the trim is lightly gold plated and shows a lot of wear. The 5/16 inch wide cap band has a repeating grouped lines and blank space pattern. The gold plated stainless steel nib is stamped EAGLE over IRIDIUM over TIPPED over MADE IN over U.S.A. According to 1949 advertisements it sold for $1.00 and came in black, grey, maroon and aquamarine, though as this example shows, also in blue. They were being sold as closeouts in 1949 for 39 cents. 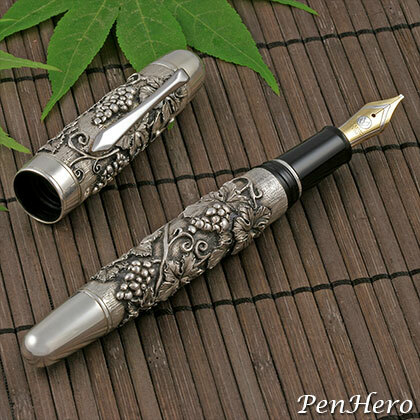 This is a Lambrou Pens Grapevine prototype, a high relief sterling silver art pen created in 2009, by the Argentinean artist Juan Carlos Pallarols. The base is a plain silver CP8 fountain pen, a full size cartridge/converter Legend 766L at 5.75 inches long. Mr. Pallarols creates thick silver tubes for the cap and barrel. He utilizes the CP8 cap top, section and nib unit, cap band and barrel end, with his creation. Through a small hammer and chisel he hand creates a very high relief unique art pen. This art using a hammer, chisel and precious metals, in particular silver, has been passed down from generation to generation for more than 250 years. The clip is hand crafted sterling silver by Paul Rossi. 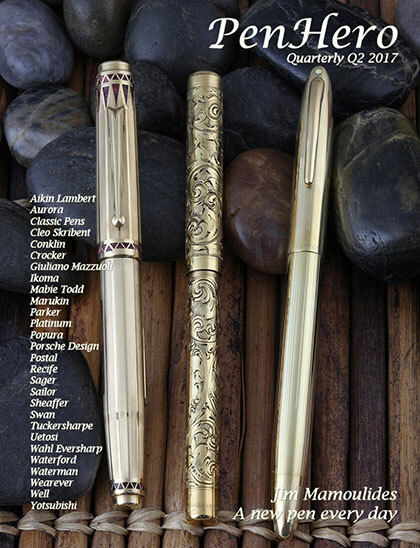 The unique Art Pen comes with a G-250, 18-karat gold nib unit, by Peter Bock of Germany. The nib is rhodium plated to compliment the sterling clip and trim. This Grapevine design, exclusive to Lambrou Pens Inc., can compete successfully, with high relief, handmade Parker and Waterman pens of the 1910s. The advantage of the Grapevine is being a modern fountain pen, parts like nibs are easily replaced if lost or damaged. 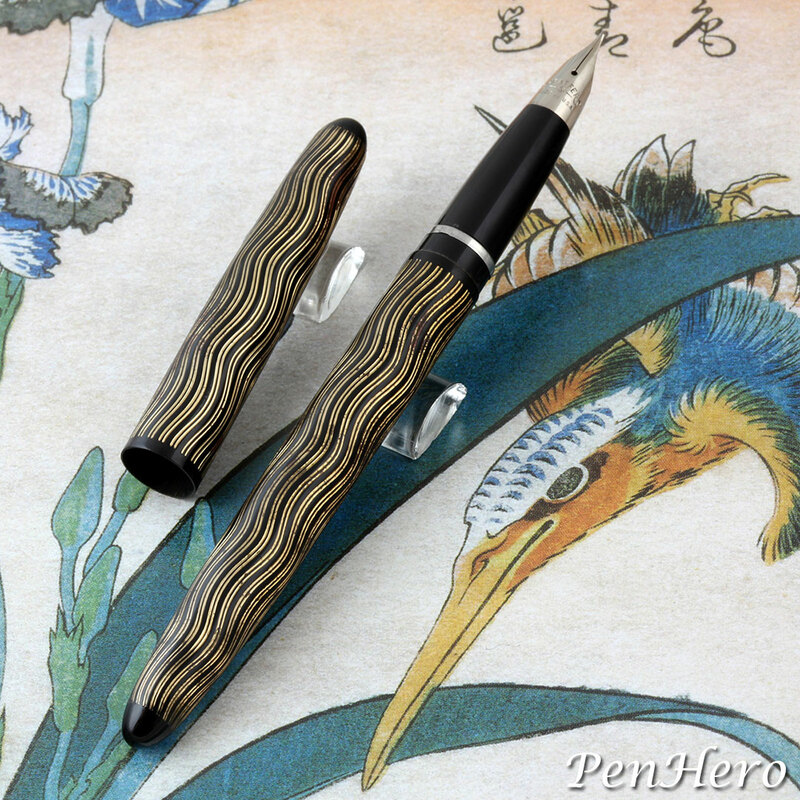 This is an Epenco fountain pen in a "caramel swirl" marbled celluloid c. 1933. This 4 3/4 inch long lever-fill pen has gold plated trim, including cap and barrel end caps, clip, filigree cap band and lever, each showing quite a lot of wear. The clip appears to be cast with EPENCO at the top. The celluloid is seamless, indicating it was probably turned from rod stock. 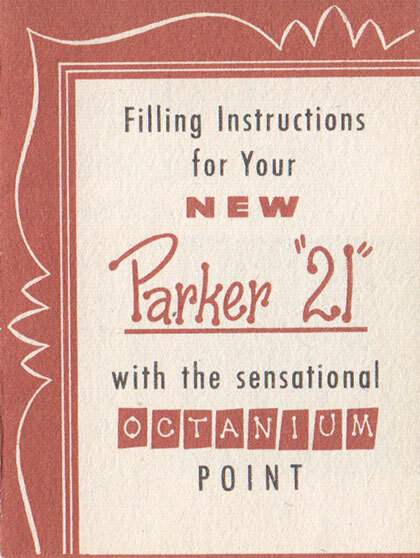 Similar pens are shown in a 1933 dated novelty catalog shown with a retail price of 25 cents. The gold plated stainless steel nib is stamped EPENCO over N.Y. These nibs were called "Durium points" in some advertisements. There are no other markings on the pen. 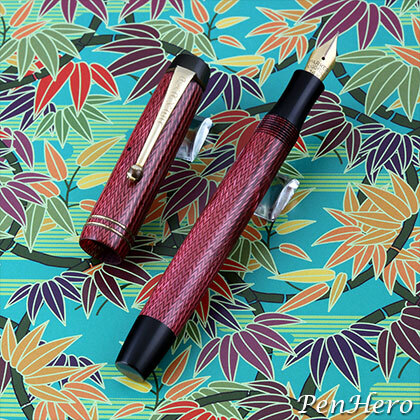 This is an Eclipse Streamline fountain pen in burgundy snakeskin c. early 1940s. The Eclipse Streamline appears to borrow design elements from the Eversharp Skyline clip. The 5 5/16 inch long pen is a lever filler and has no barrel imprint. Many different celluloids were used on the Streamline pen, including black, marbled colors and snakeskin colors. At least two barrel shapes are used, including this flat end with a pointed end cap and a more tapered end. The very firm stainless steel nib reads ECLIPSE over OSMIRIDIUM over POINTED over CANADA. As can be seen, the gold plating on the trim and nib was very thin and subject to wearing off. This is a Conway Stewart 550 Dinkie fountain pen in a marbled green with black veins casein c. 1952-1962. It's a 4 1/16 inch long lever filler with all gold plate trim, though the trim shows moderate plating loss. According to conwaystewartpens.co.uk, there are three versions of the 550. This would be the early version, with a small clip that is part of the cap top ring and the barrel imprint has DINKIE on the top line. Early Dinkies came in blue moire, green moire, marbled plum with black veins, marbled blue with black veins and marbled green with black veins casein. The barrel is stamped “DINKIE” 550 over the Conway Stewart logo. The 14 karat gold nib is stamped Conway over Stewart over 14CT GOLD. This is a Conway Stewart 550 Dinkie fountain pen in a marbled green with brown flecks and veins casein c. 1952-1962. It's a 4 1/16 inch long lever filler with all gold plate trim, though the trim shows moderate plating loss. 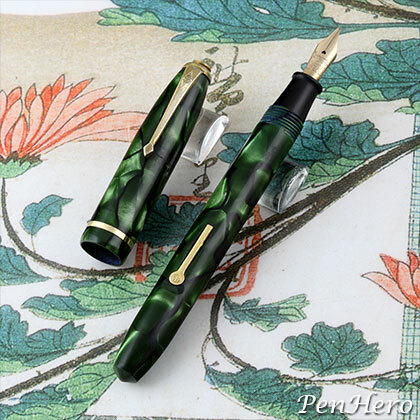 According to conwaystewartpens.co.uk, there are three versions of the 550. This would be the latest version, with a larger clip that is separate from the cap top ring and the barrel imprint has DINKIE on the top line. Late Dinkies came in nine marbled casein colors. The barrel is stamped DINKIE 550 over the Conway Stewart logo. The 14 karat gold nib is stamped Conway over Stewart over 14CT GOLD. 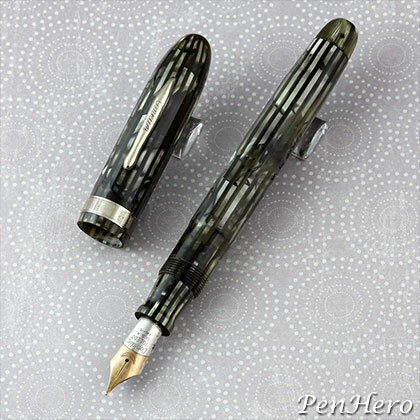 This is a large size Conklin Nozac Penline Grey Pearl faceted piston fill fountain pen c. 1936. The Nozac Penline was introduced in 1936 and came in rounded and faceted versions. Nozac pens use a piston filling system Conklin introduced in 1931. The pen fills by twisting the end cap while the nib is in ink. The ink level could be seen in the translucent barrel. These 5 3/16 inches long pens were offered three colors, including Grey Pearl, Red Pearl, and Green Pearl with the new 1936 patented clip. 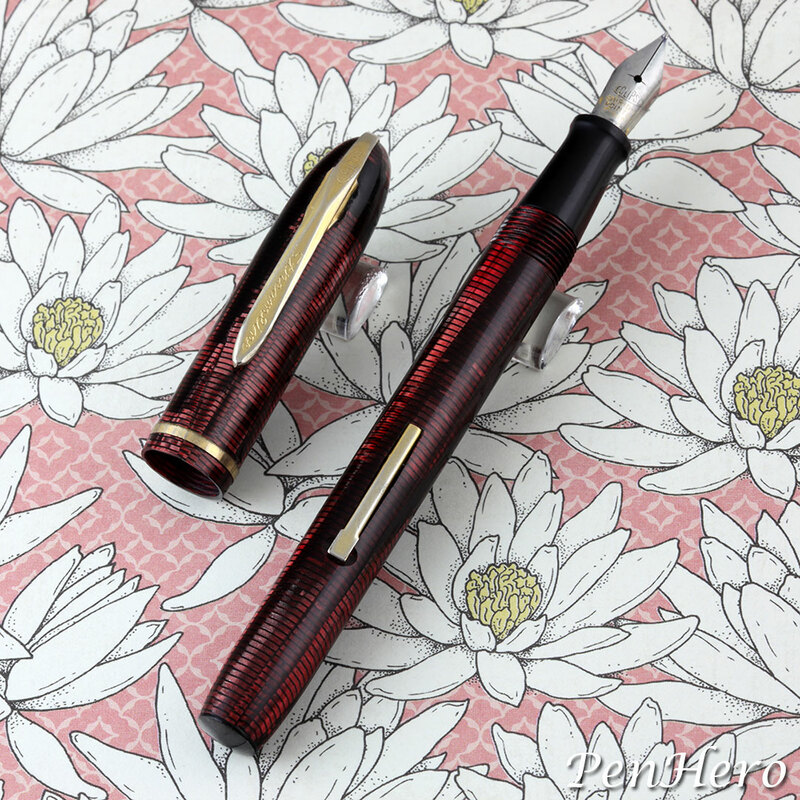 This example has a two-tone Toledo nib instead of the usual 14 karat gold nib stamped CONKLIN over CUSHON over POINT over 14KT over U.S.A. At the top of the nib is the Conklin Crescent logo. This pen also has a section made from the same material as the barrel instead of the usual black. 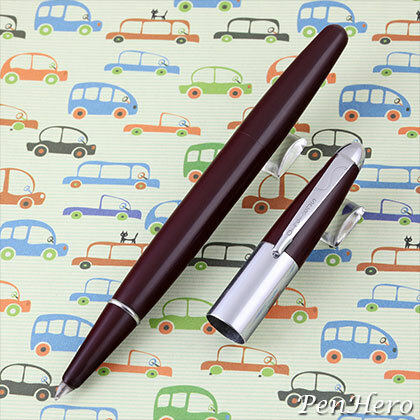 Large size Nozac Penline pens like this one sold for $7.50 and the matching pencil was $3.50. This is a standard size Conklin Nozac Penline Green Pearl faceted piston fill fountain pen c. 1936. This size pen has a 12 facet cap and barrel. The Nozac Penline was introduced in 1936 and came in rounded and faceted versions. Nozac pens use a piston filling system Conklin introduced in 1931. The pen fills by twisting the end cap while the nib is in ink. The ink level could be seen in the translucent barrel. These 5 3/16 inches long pens were offered three colors, including Grey Pearl, Red Pearl, and Green Pearl with the new 1936 patented clip. 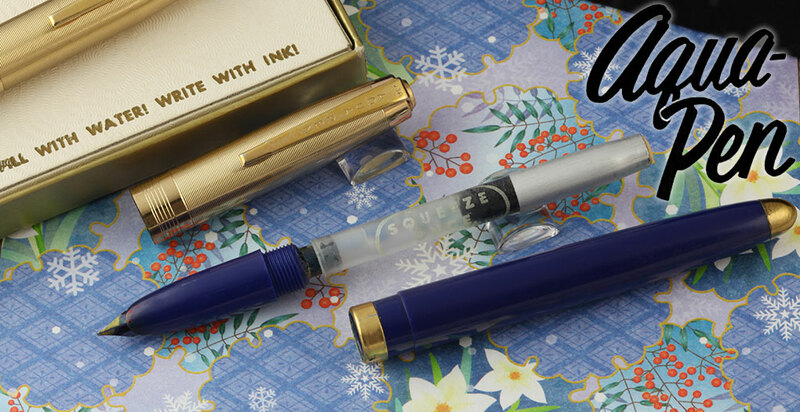 This example has the 14 karat gold nib stamped CONKLIN over CUSHON over POINT over 14KT over U.S.A. At the top of the nib is the Conklin Crescent logo. This pen also has a black section. Standard size Nozac Penline pens like this one sold for $5.00 and the matching pencil was $3.50. This is a Sheaffer Snorkel Clipper Pastel Blue fountain pen c. 1952-1955. 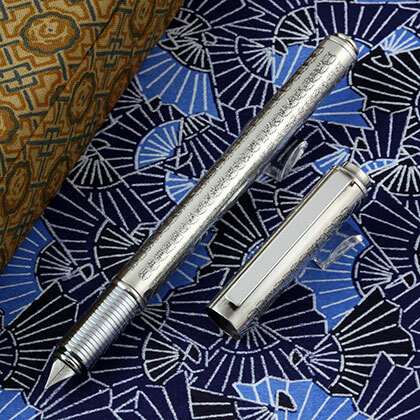 The fountain pen has a Triumph palladium-silver alloy nib (some are hallmarked PdAg), polished stainless steel cap with a repeating pattern of four straight longitudinal engraved lines in a stepped grouping, gold-filled cap band, gold-filled clip, and plastic barrel. 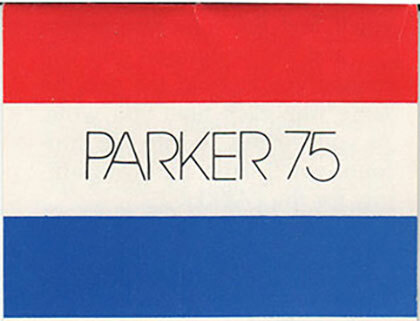 Barrel colors produced from 1952 to 1955 were black, burgundy, pastel gray, pastel blue (or aqua), and pastel green. Peacock blue, buckskin tan, mandarin orange, fiesta red, and sage green were added later. The Clipper fountain pen is 5 ½ inches long and sold for $18.50. 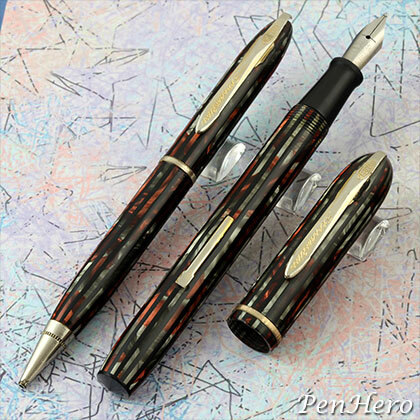 The matching Sentinel ballpoint sold for $3.95. The matching pencil sold for $7.50. 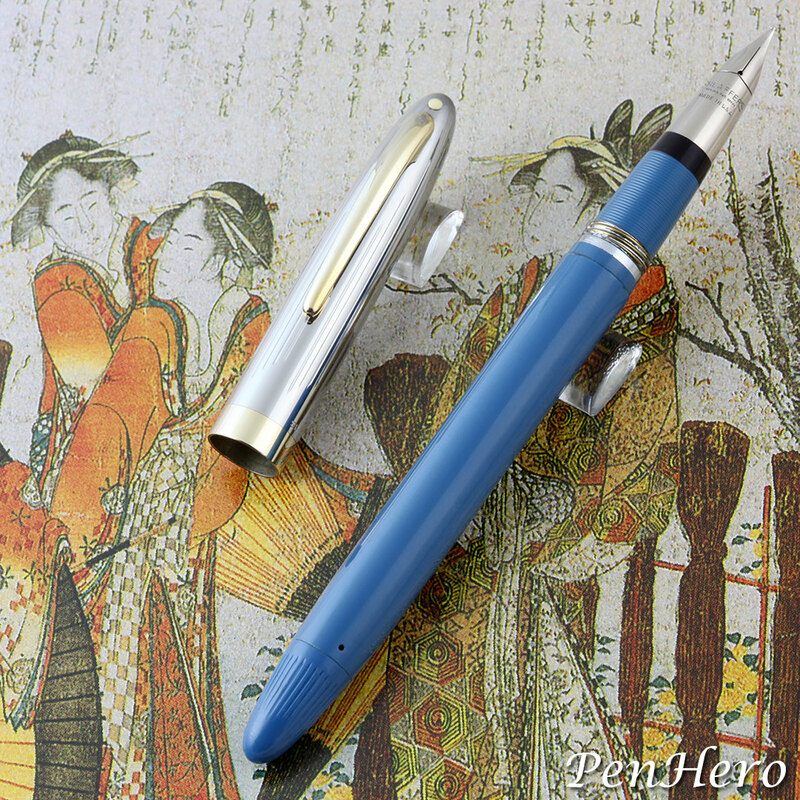 This is a Sheaffer Snorkel Clipper Pastel Blue fountain pen c. 1957-1959. The pen can be dated some time after Sheaffer introduced color match sections. The fountain pen has a Triumph palladium-silver alloy nib (some are hallmarked PdAg), polished stainless steel cap with a repeating pattern of four straight longitudinal engraved lines in a stepped grouping, gold-filled cap band, gold-filled clip, and plastic barrel. Barrel colors produced from 1952 to 1955 were black, burgundy, pastel gray, pastel blue (or aqua), and pastel green. Peacock blue, buckskin tan, mandarin orange, fiesta red, and sage green were added later. The Clipper fountain pen is 5 ½ inches long and sold for $18.50. The matching Sentinel ballpoint sold for $3.95. The matching pencil sold for $7.50. This is an Eagle brass metal fountain pen in with a marbled green painted finish c. 1922-1926. 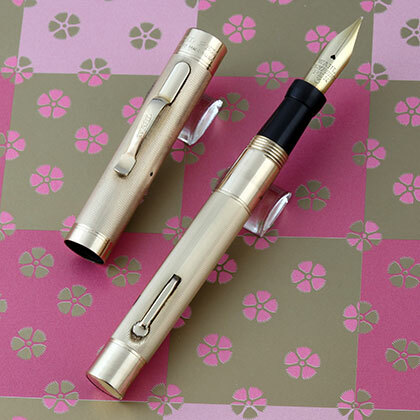 This 5 1/8 inch long lever-fill pen has a gold plated clip and lever. The clip is stamped EAGLE PENCIL CO. U.S.A. The cap and barrel design and lever mechanism are similar to that shown in the 1926 Eagle Pencil Company lever mechanism patent by Eric G. Pearson, applied for in 1922. The nib is not hallmarked and may be gold plated stainless steel. It's stamped MARVEL over PEN and is probably a replacement nib. There are no other markings on the pen. This is a Sheaffer Snorkel Clipper Pastel Green fountain pen c. 1952-1959. 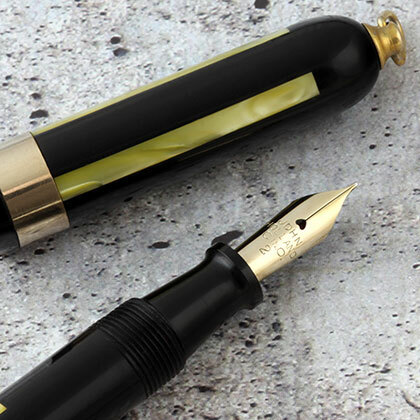 The fountain pen has a Triumph palladium-silver alloy nib (some are hallmarked PdAg), polished stainless steel cap with a repeating pattern of four straight longitudinal engraved lines in a stepped grouping, gold-filled cap band, gold-filled clip, and plastic barrel. Barrel colors produced from 1952 to 1955 were black, burgundy, pastel gray, pastel blue (or aqua), and pastel green. Peacock blue, buckskin tan, mandarin orange, fiesta red, and sage green were added later. The Clipper fountain pen is 5 ½ inches long and sold for $18.50. The matching Sentinel ballpoint sold for $3.95. The matching pencil sold for $7.50. 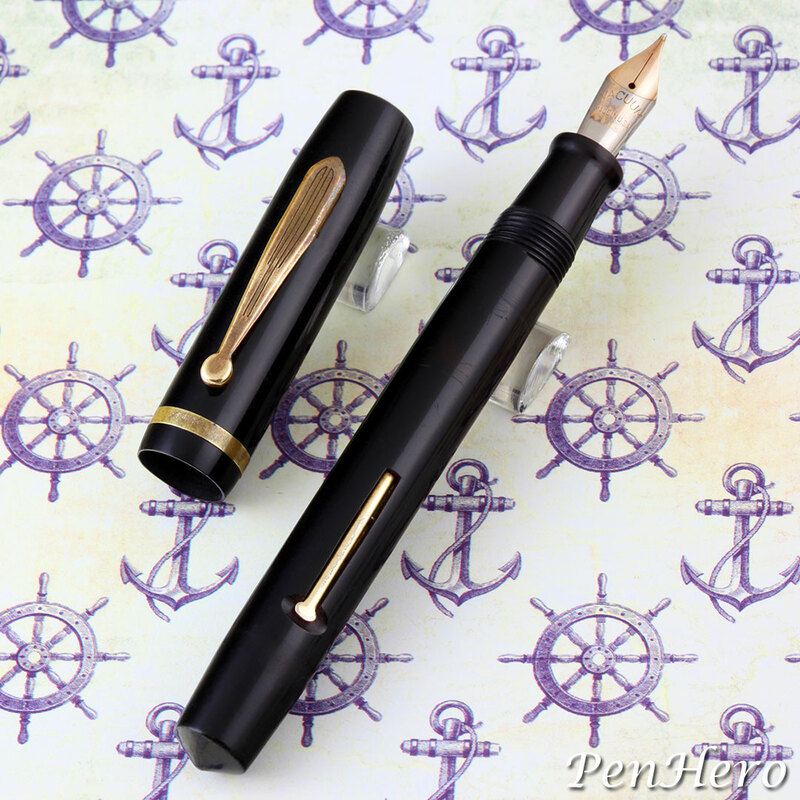 This is a Sheaffer Snorkel Clipper Black fountain pen c. 1952-1959. 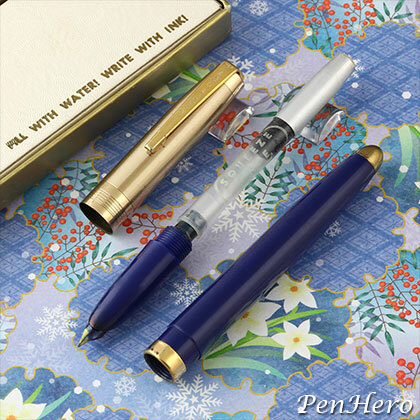 The fountain pen has a Triumph palladium-silver alloy nib (some are hallmarked PdAg), polished stainless steel cap with a repeating pattern of four straight longitudinal engraved lines in a stepped grouping, gold-filled cap band, gold-filled clip, and plastic barrel. Barrel colors produced from 1952 to 1955 were black, burgundy, pastel gray, pastel blue (or aqua), and pastel green. Peacock blue, buckskin tan, mandarin orange, fiesta red, and sage green were added later. The Clipper fountain pen is 5 ½ inches long and sold for $18.50. The matching Sentinel ballpoint sold for $3.95. The matching pencil sold for $7.50. 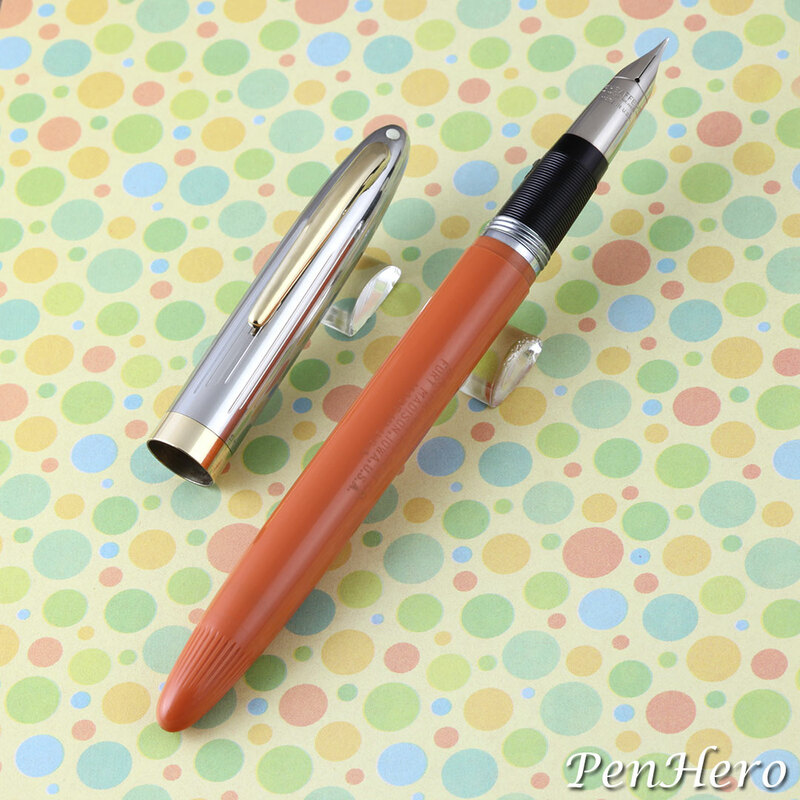 This is a Sheaffer Snorkel Clipper Mandarin Orange fountain pen c. 1956-1959. The fountain pen has a Triumph palladium-silver alloy nib (some are hallmarked PdAg), polished stainless steel cap with a repeating pattern of four straight longitudinal engraved lines in a stepped grouping, gold-filled cap band, gold-filled clip, and plastic barrel. Barrel colors produced from 1952 to 1955 were black, burgundy, pastel gray, pastel blue (or aqua), and pastel green. Peacock blue, buckskin tan, mandarin orange, fiesta red, and sage green were added later. The Clipper fountain pen is 5 ½ inches long and sold for $18.50. The matching pencil sold for $7.50. 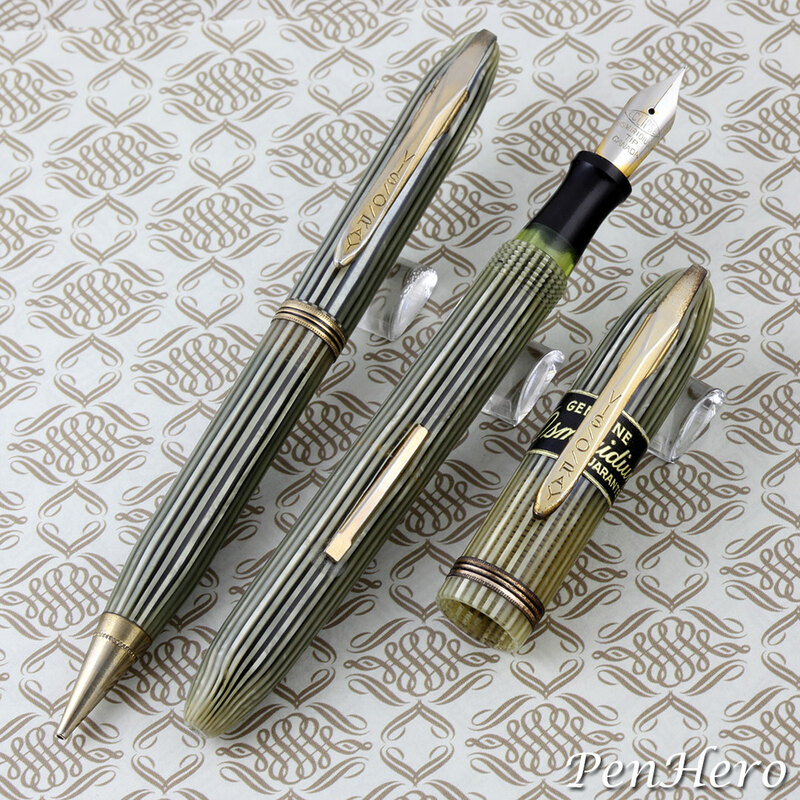 This is an Eclipse Vis-O-Ray fountain pen and pencil set in silver and black striped celluloid c. 1940s. This 5 inch long Vis-O-Ray follows the Streamline design with a bullet shaped cap and barrel and a similar over the top clip stamped VIS-O-RAY. The name may derive from the visulated section. The black stripes of the celluloid are translucent. The silver strips, especially on the cap, have faded to a light brown color. It's a lever filler and has VIS-O-RAY over ECLIPSE FOUNTAIN PEN AND PENCIL CO. LTD. over TORONTO - CANADA over DESIGN REG. stamped on the barrel. Wrapped around the cap under the clip is a wide paper band printed with "Genuine Osmiridium Point Guaranteed Lifetime Service." The clip and trim were gold plated, though much has worn off. The very firm stainless steel nib was gold plated and reads ECLIPSE over OSMIRIDIUM over TIP over CANADA. The pencil is twist action. 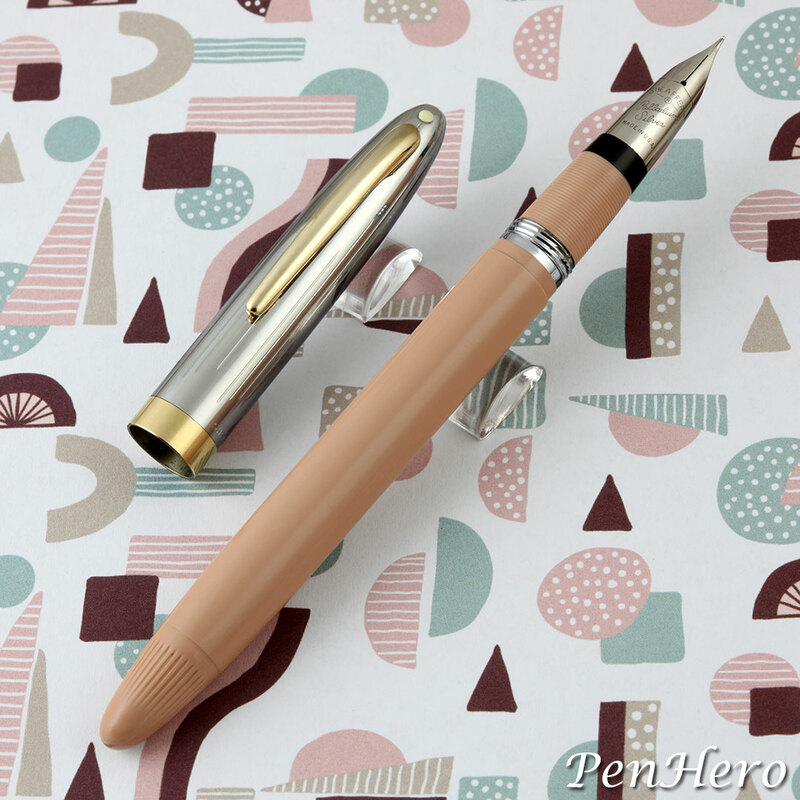 This is a Sheaffer Snorkel Clipper Buckskin Tan fountain pen c. 1956-1959. The fountain pen has a Triumph palladium-silver alloy nib with Palladium Silver in script, a color match section, polished stainless steel cap with a repeating pattern of four straight longitudinal engraved lines in a stepped grouping, gold-filled cap band, gold-filled clip, and plastic barrel. Barrel colors produced from 1952 to 1955 were black, burgundy, pastel gray, pastel blue (or aqua), and pastel green. Peacock blue, buckskin tan, mandarin orange, fiesta red, and sage green were added later. 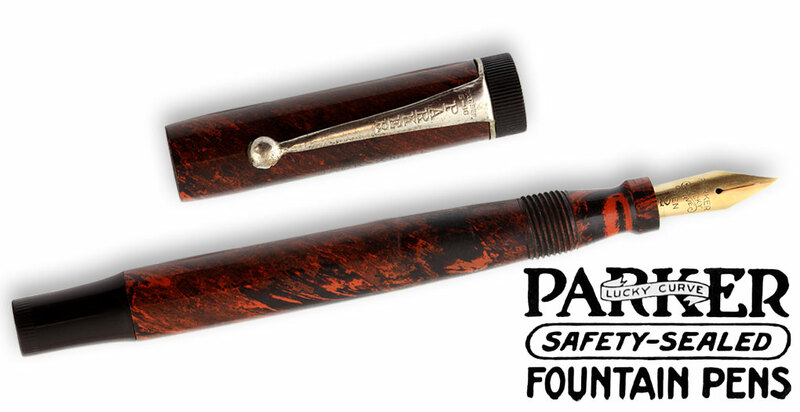 The Clipper fountain pen is 5 ½ inches long and sold for $18.50. The matching pencil sold for $7.50. 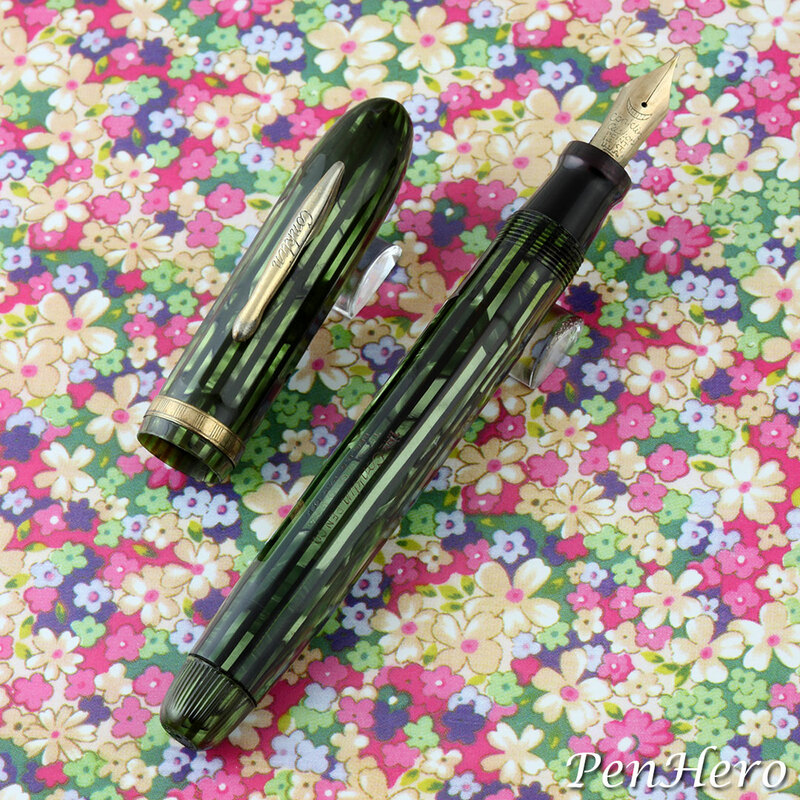 This is a Scripto "long writing" fountain pen in Radiant Dubonnet injection molded plastic c. 1947. Designed by Walter Dorwin Teague, an American industrial designer and architect known for mid-century modernism. It's a 5 1/4 inches long bulb filler, trademarked "Magnifill" by Scripto, that operates by removing the blind cap from the barrel, as shown, and with the nib in the inkwell, squeezing the rubber bulb several times to fill. 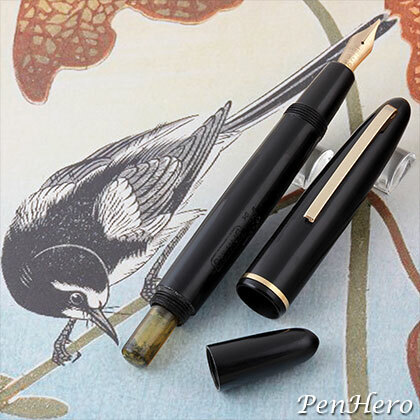 The pen has a short breather tube in the feed to regulate air inside the ink sac. The design strongly resembles the Waterman Taperite Citation, introduced about a year earlier. All the trim is heavy chrome plated. The clip has the Scripto logo and SCRIPTO stamped on the face. The hooded stainless steel "Solidium" nib was available in fine, medium, or broad. It was made in Lustrous Black, Imperial Blue, Radiant Dubonnet, and Twilight Gray. The pen sold for $3.50 and the matching pencil was $1.50.